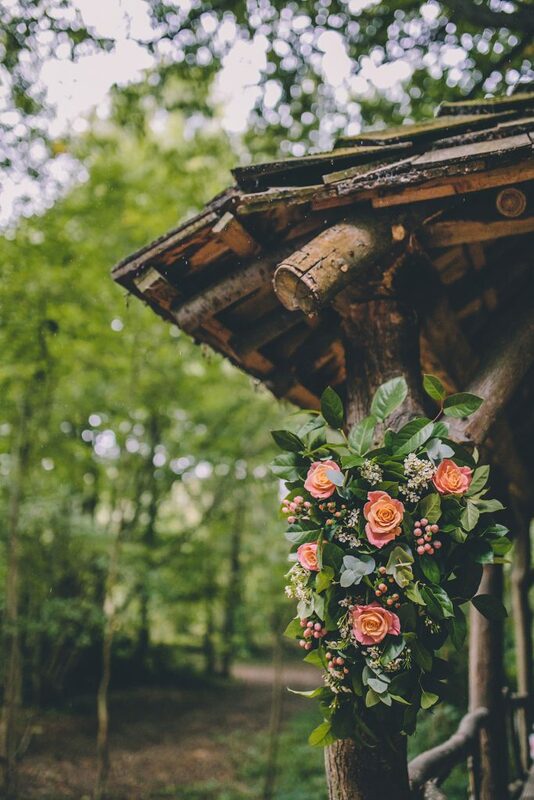 Flowers really help set the scene on a wedding day – rustic, classic, contemporary, understated, oversized, multi-coloured, full of texture, full of colour, simple or uniform – with so many options and styles to choose from, it’s certainly one of the most fun parts of wedding planning and there’s something to suit everyone. 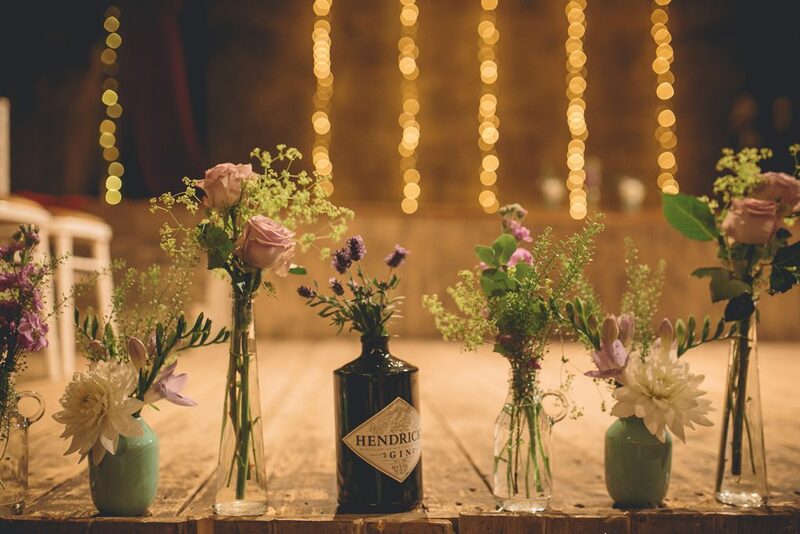 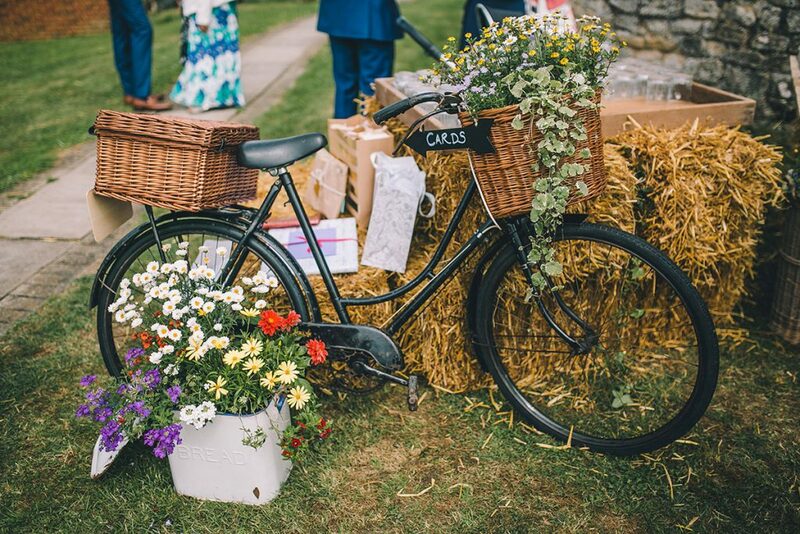 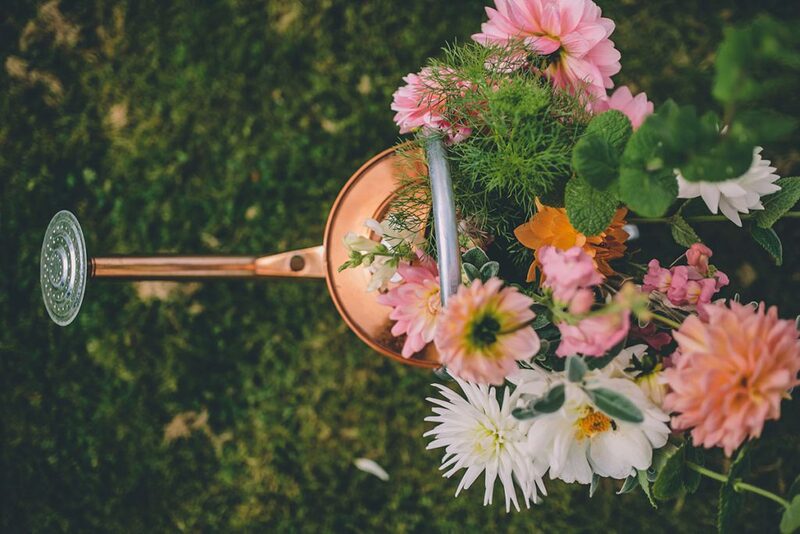 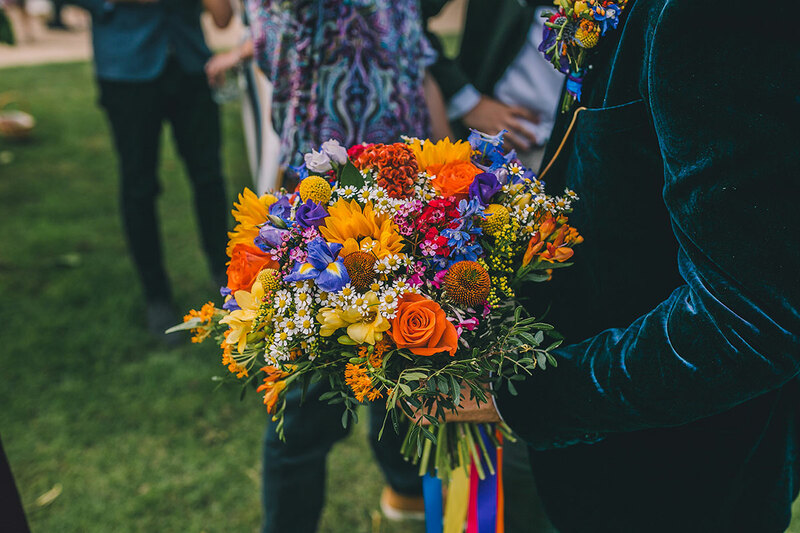 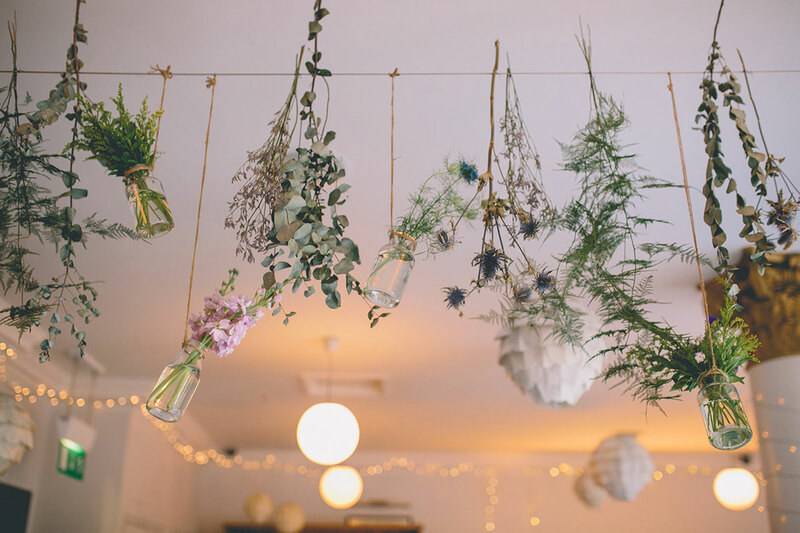 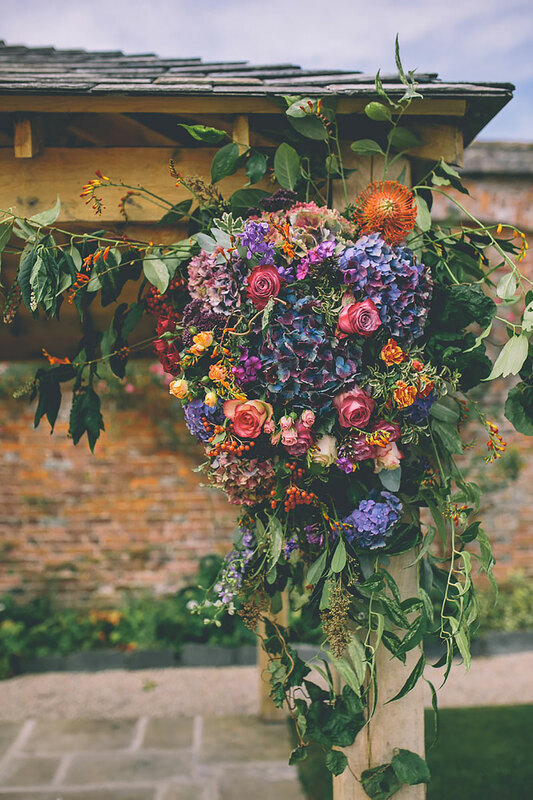 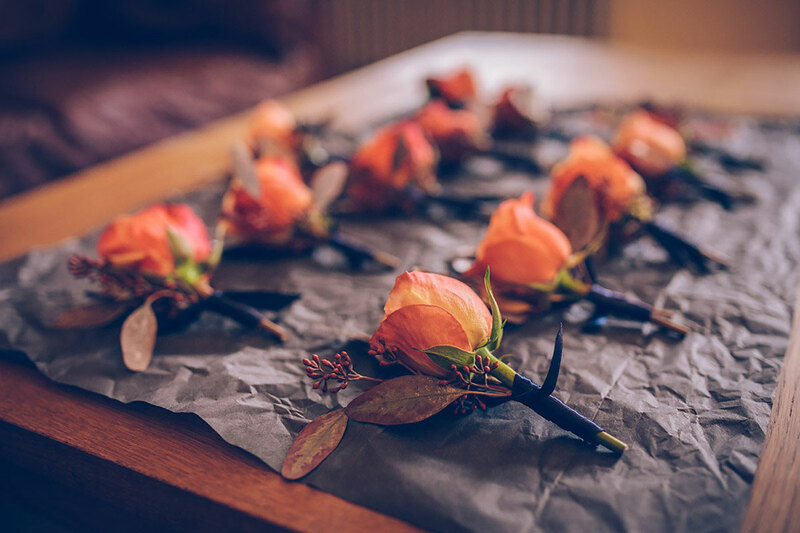 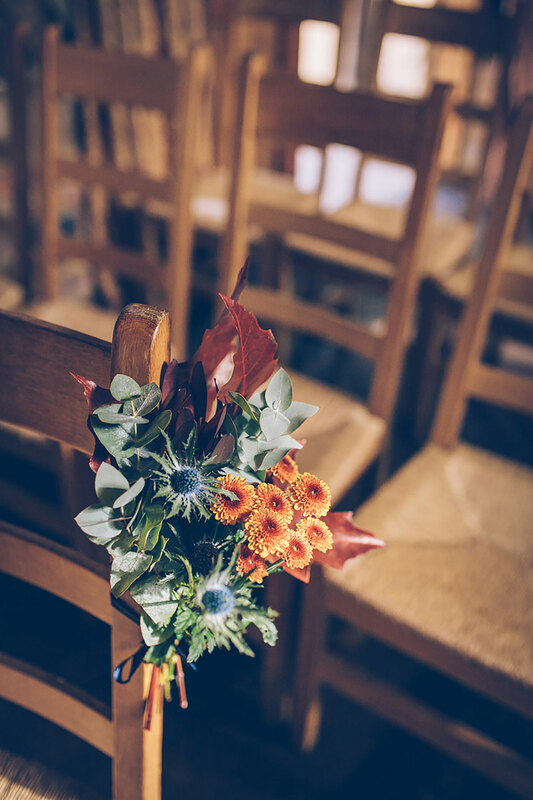 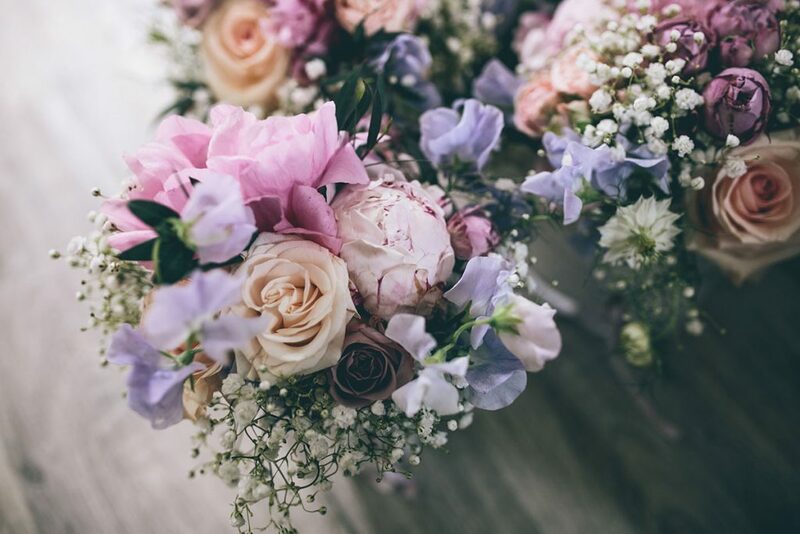 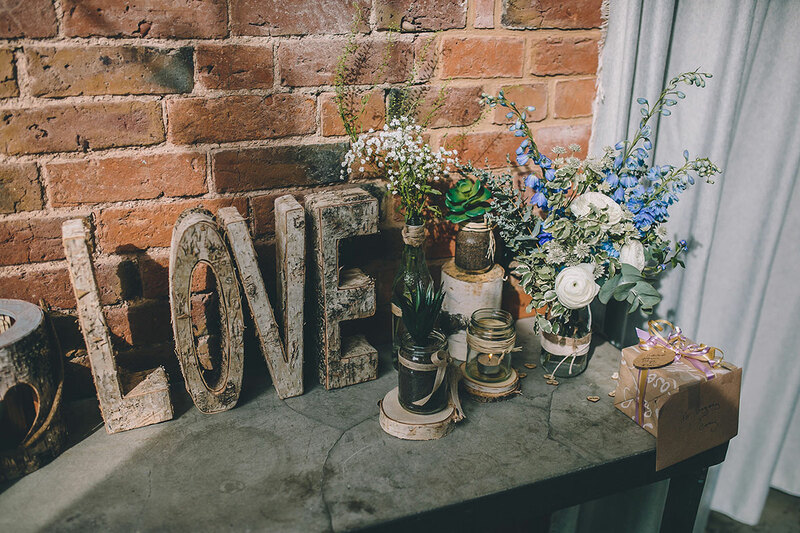 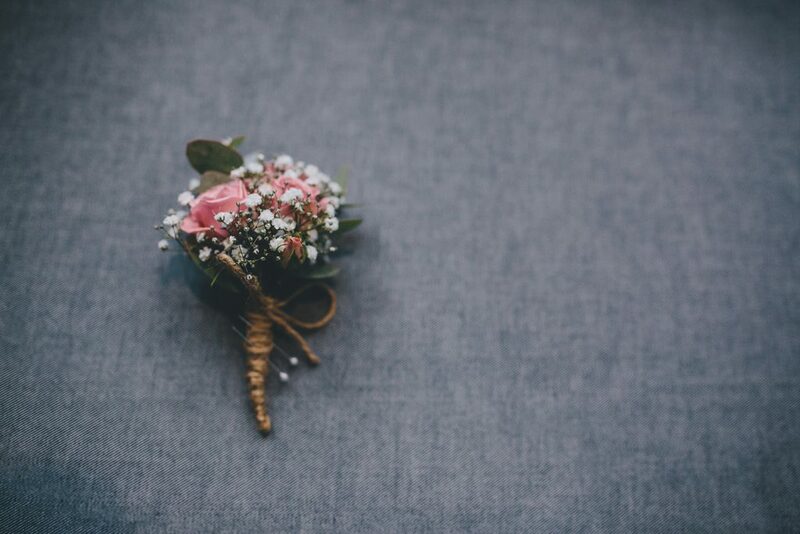 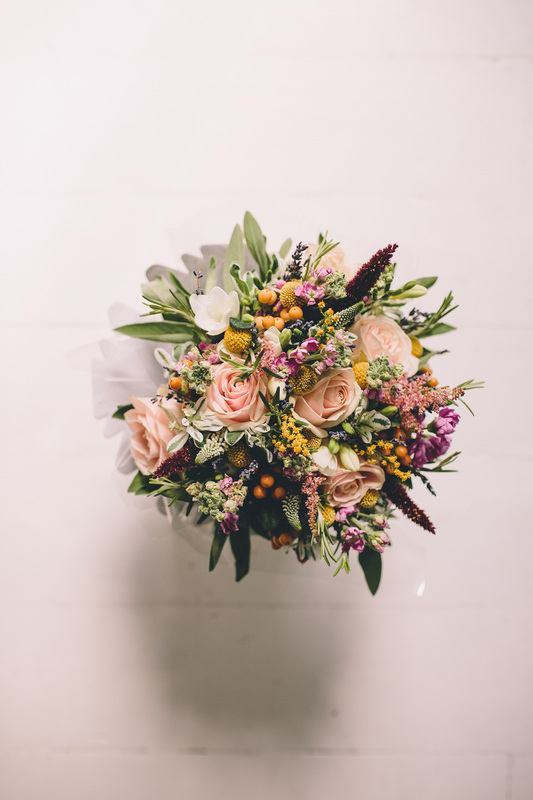 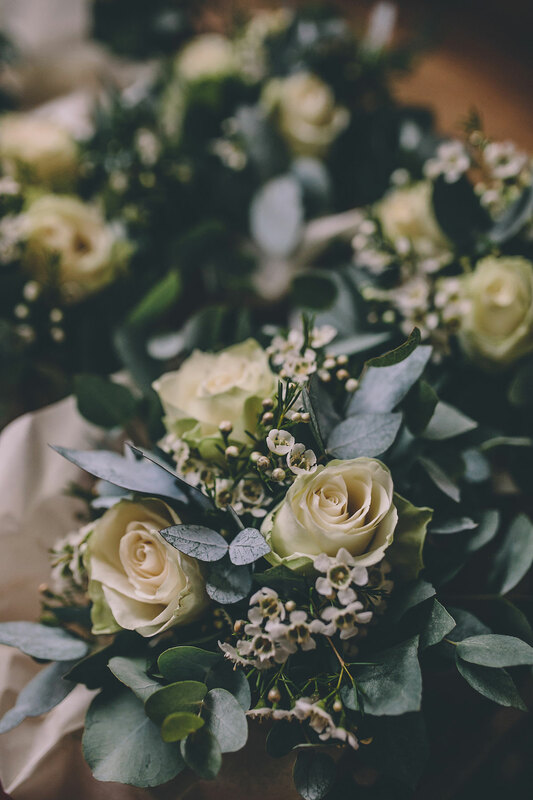 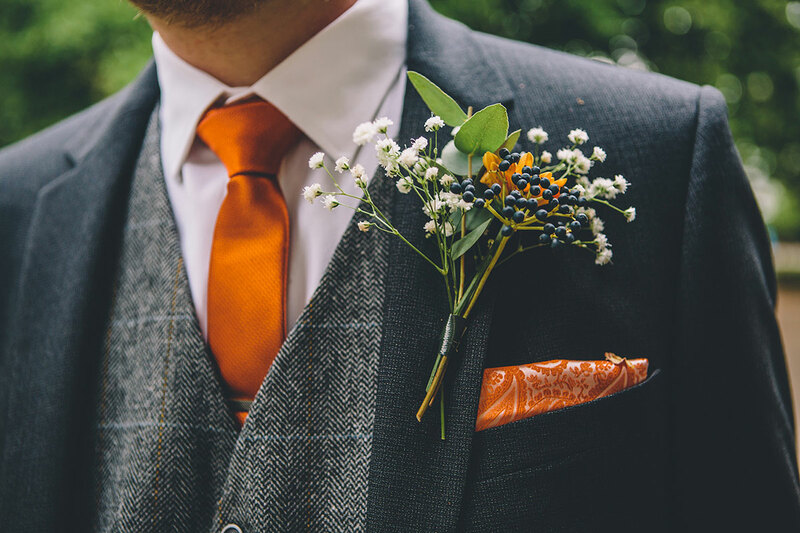 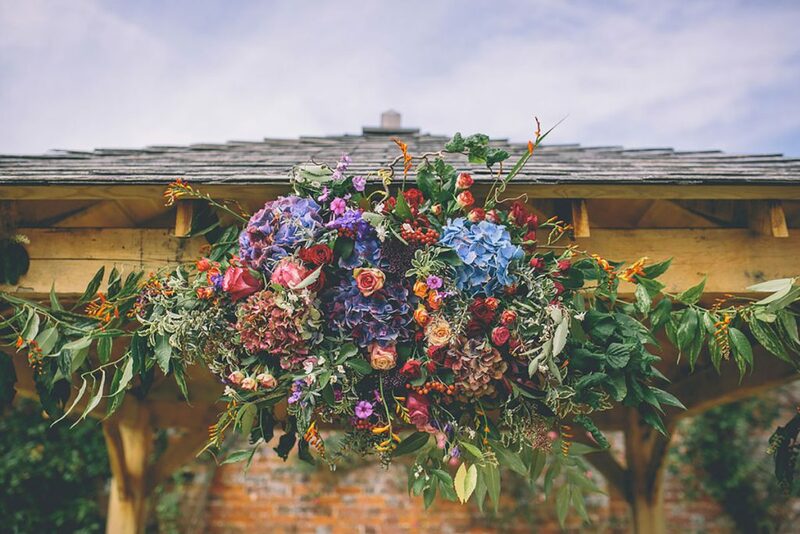 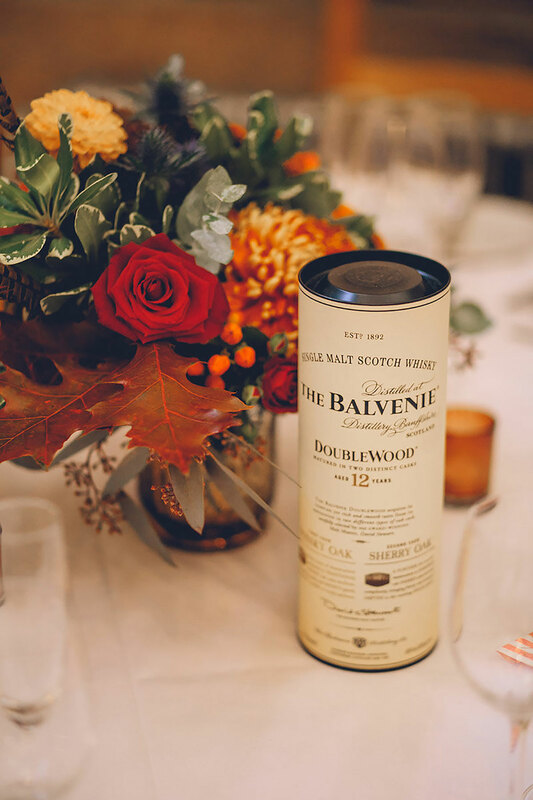 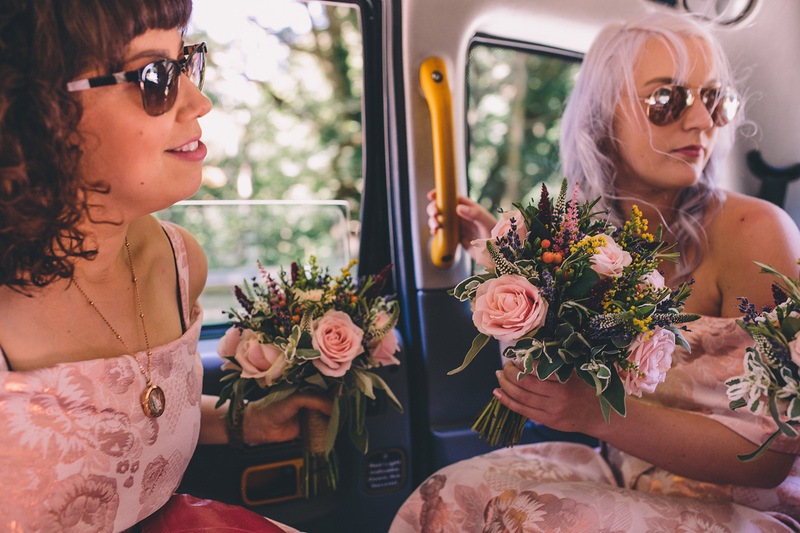 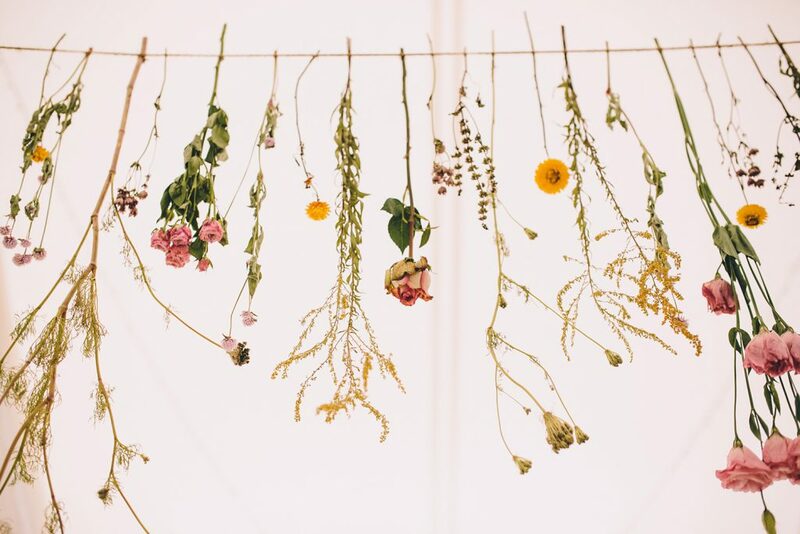 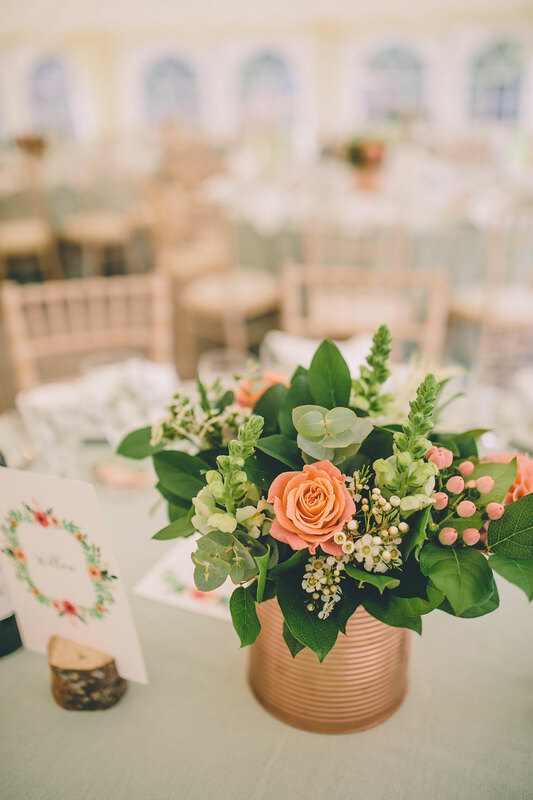 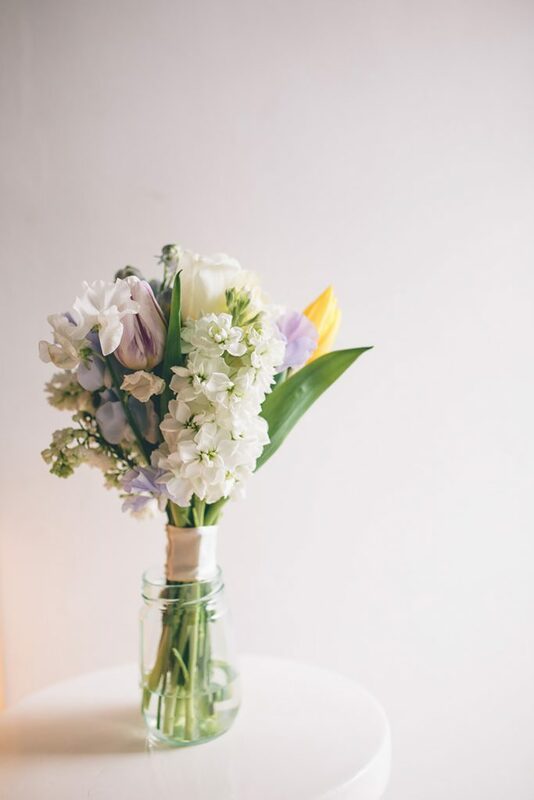 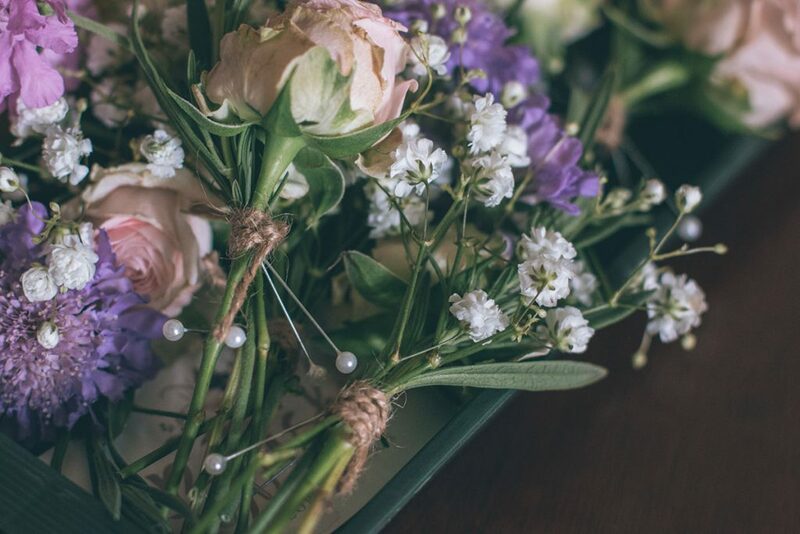 We’ve taken a look back over some of our favourite floral moments and compiled them here for your wedding day inspiration. 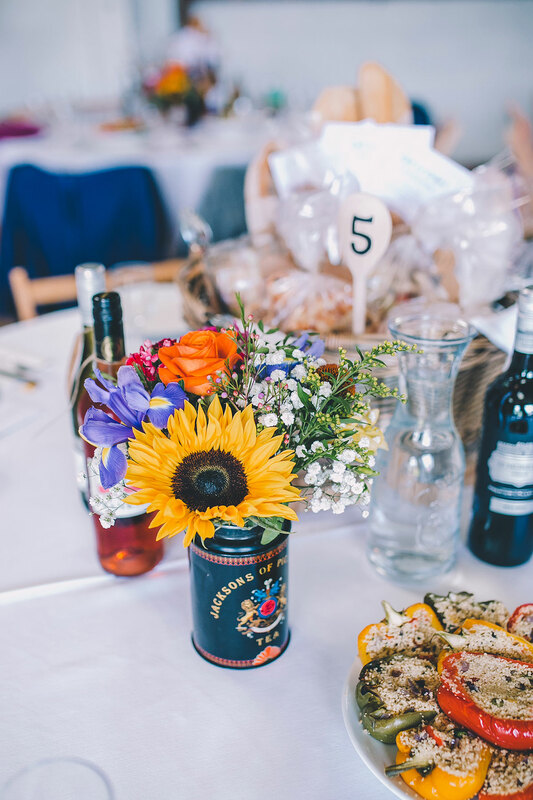 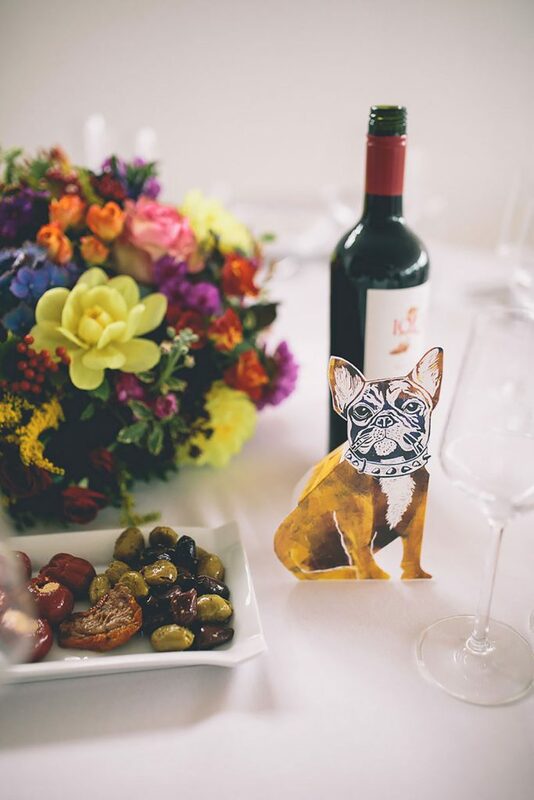 This bright, vibrant, sunny wedding could only have bold, vivid blooms to match. 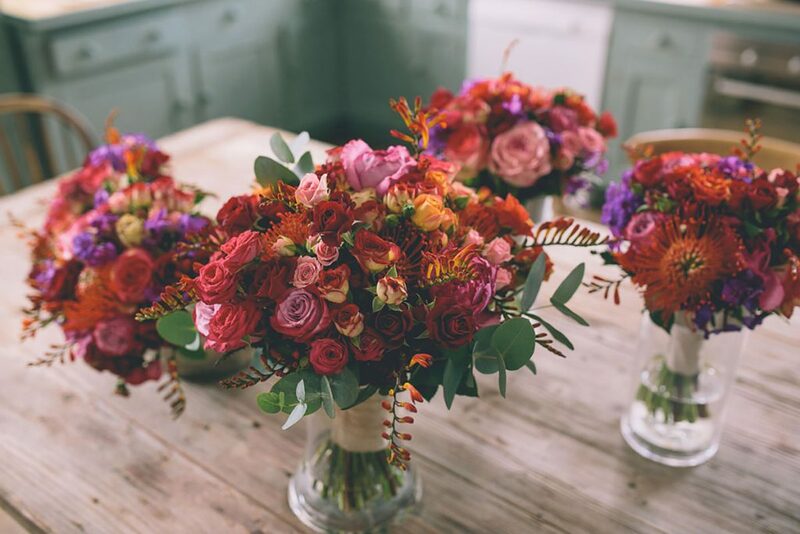 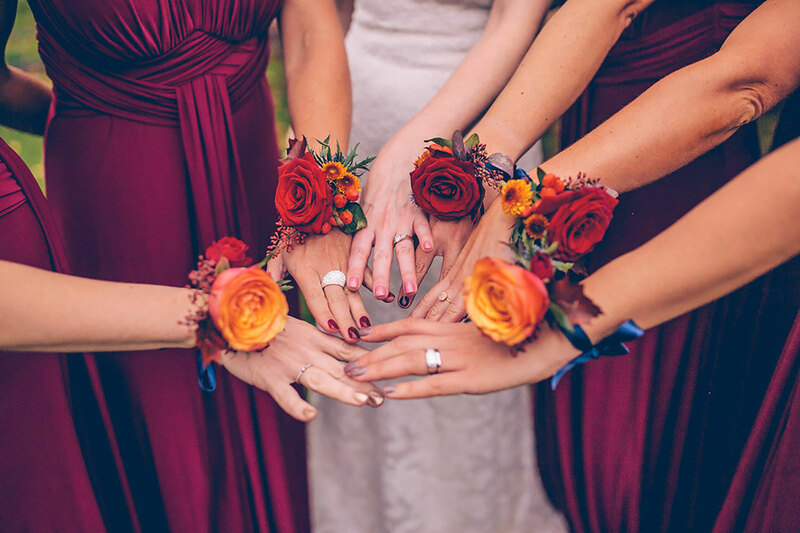 Broadly yellow, orange and blue, Grace’s bouquet was also peppered with pinks and reds. 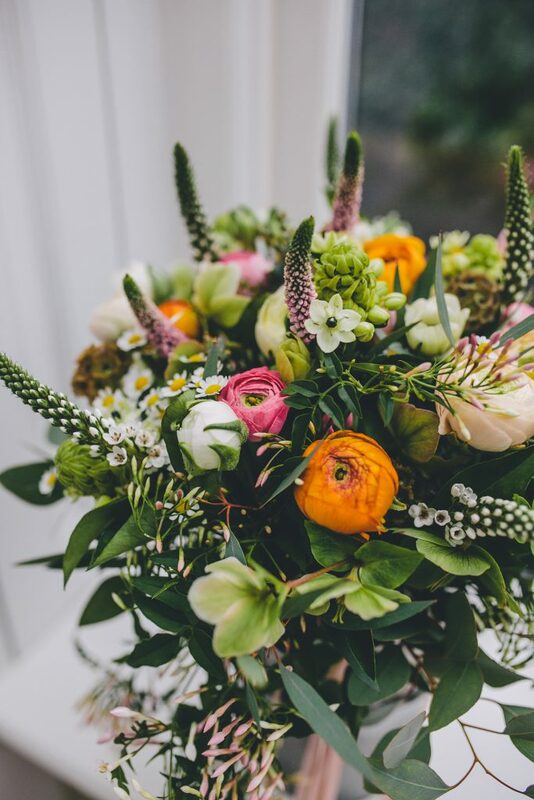 Big sunflower heads sat amongst orange roses, freesias, iris’, daisies crocosmia and lisianthus creating an eclectic, fun and fragrant arrangement. This one doesn’t include any flowers at all, yet is as stunning as the rest. 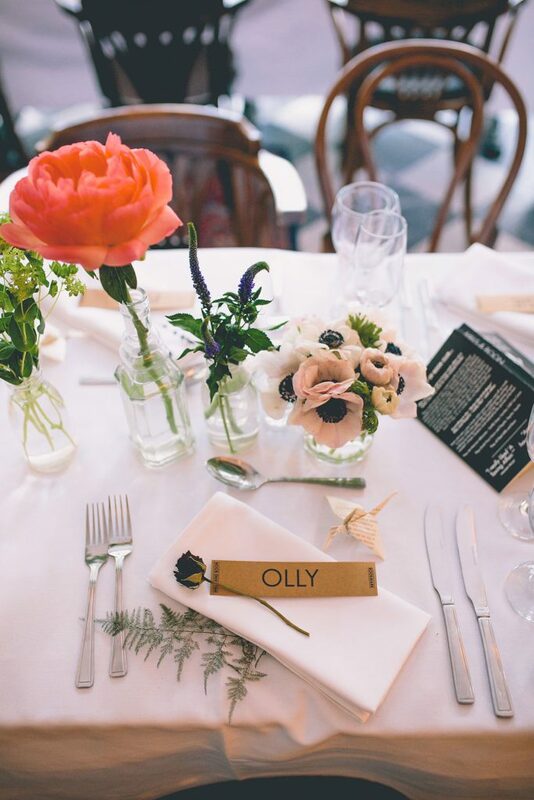 Cath + Will opted for various complimentary green foliage, including bay and fern leaves. 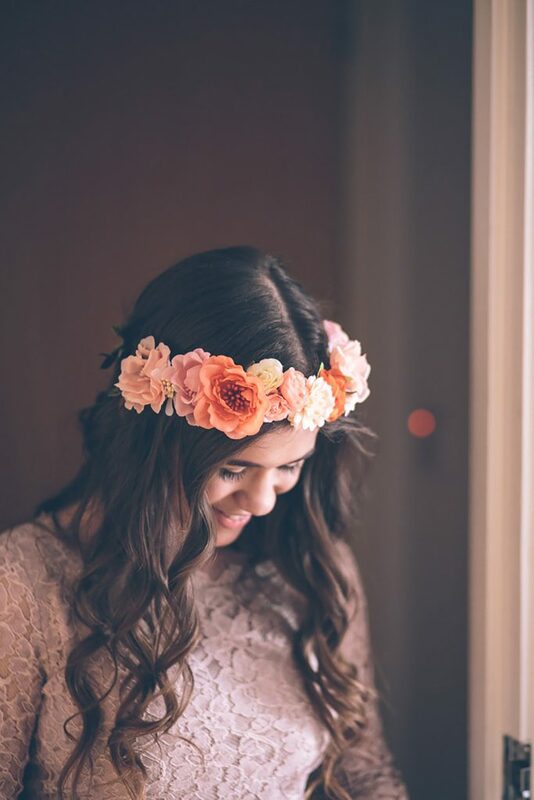 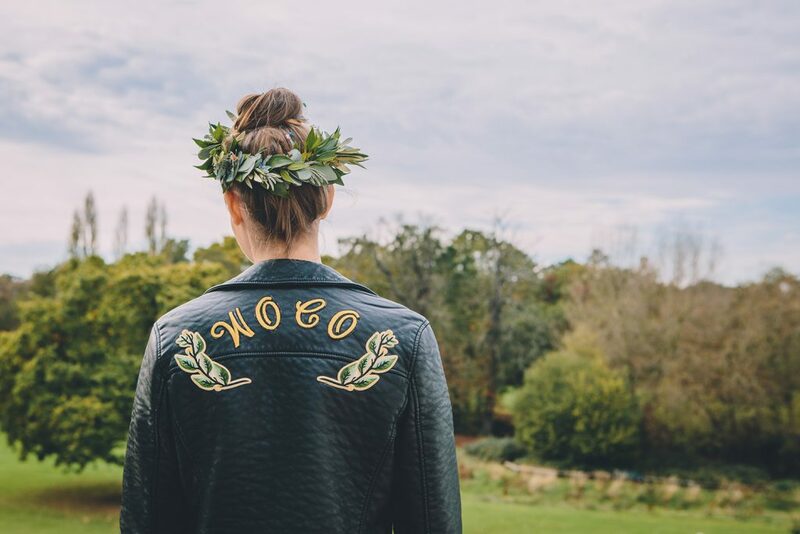 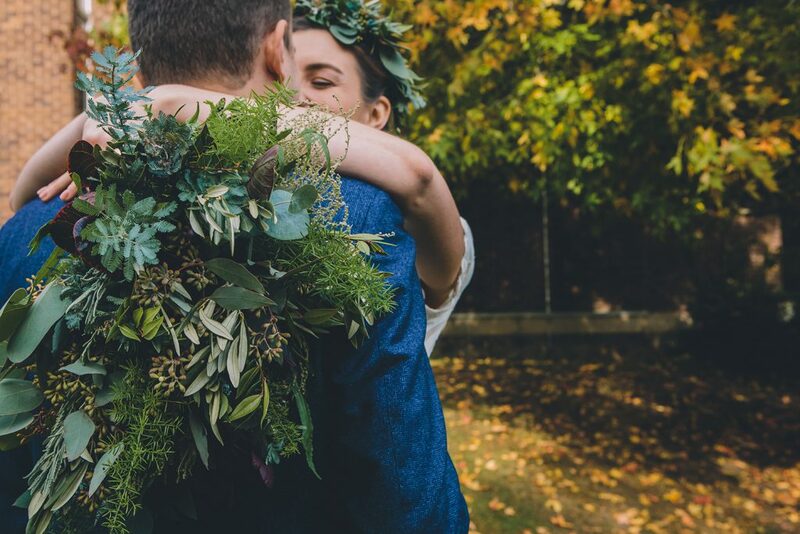 And if a bouquet of greens wasn’t enough, how about that bridal crown? 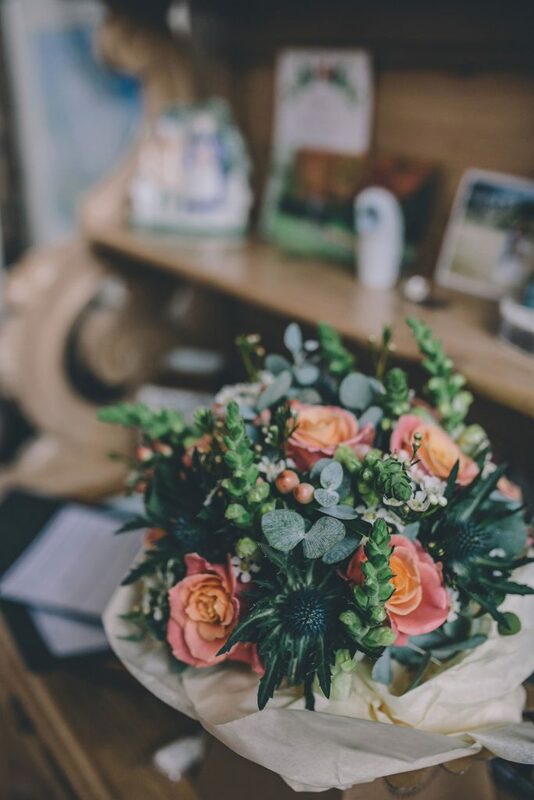 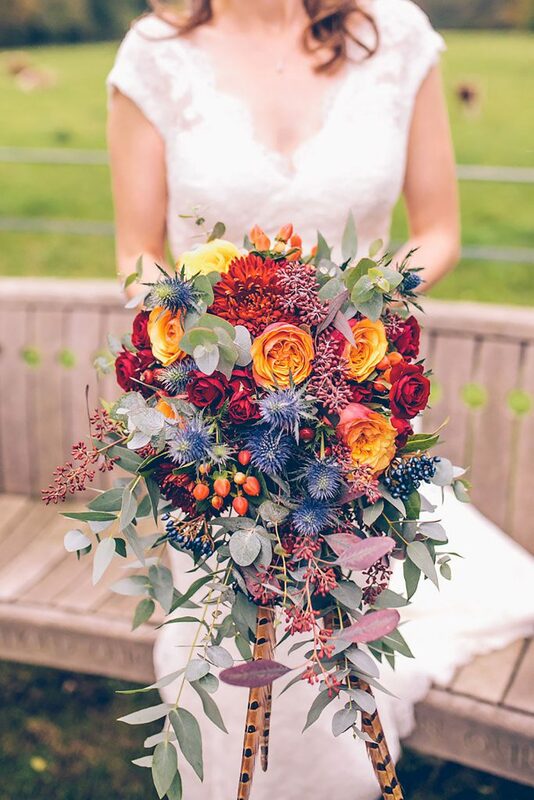 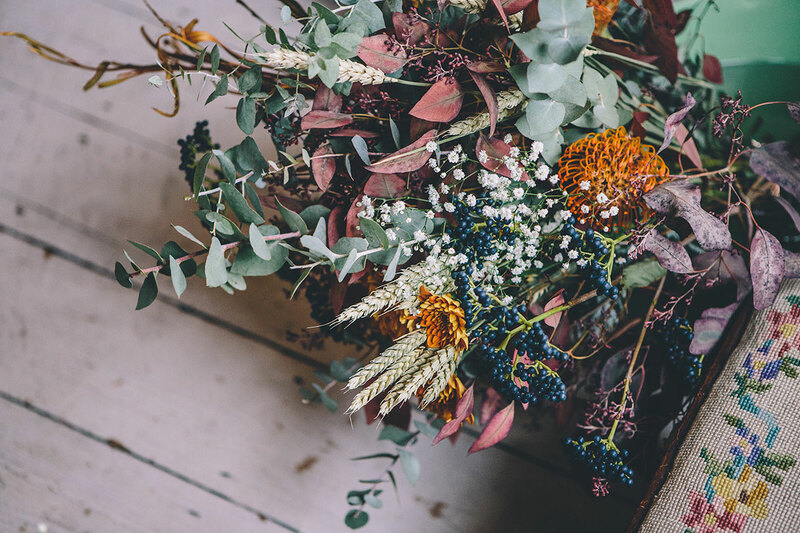 Erin’s autumn-hued bouquet had the most elegant finishing touch of two pheasant feathers, which sat along side stunning thistles, red roses chrysanthemum, eucalyptus leaves and rosehips, creating a gorgeous array of textures, scale and colours. 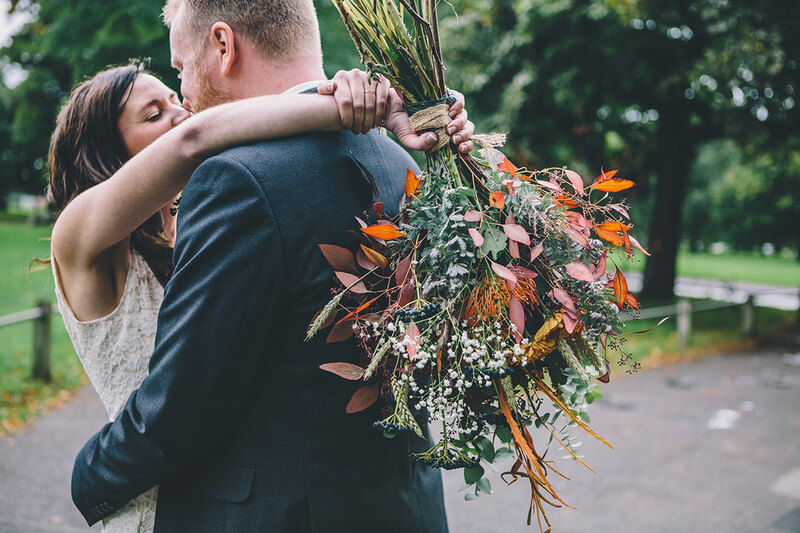 The peaches and cream blooms were the icing on the cake of Olivia + Lawrence’s wedding in the woods. 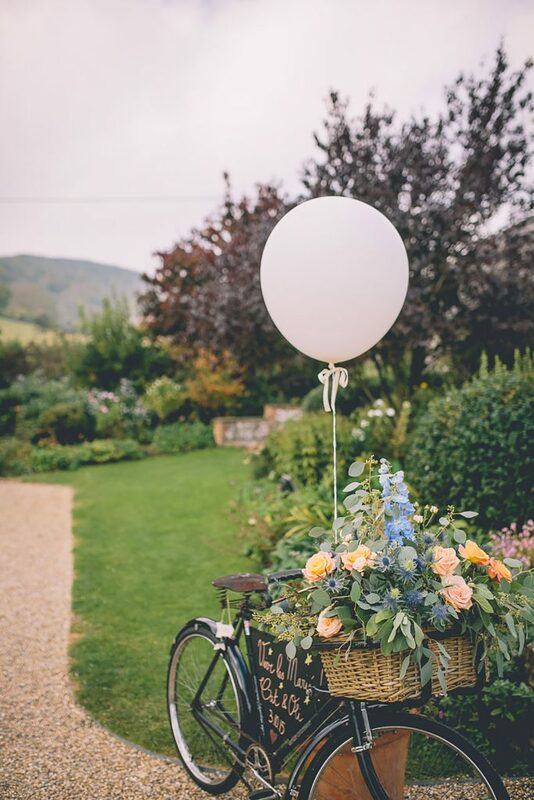 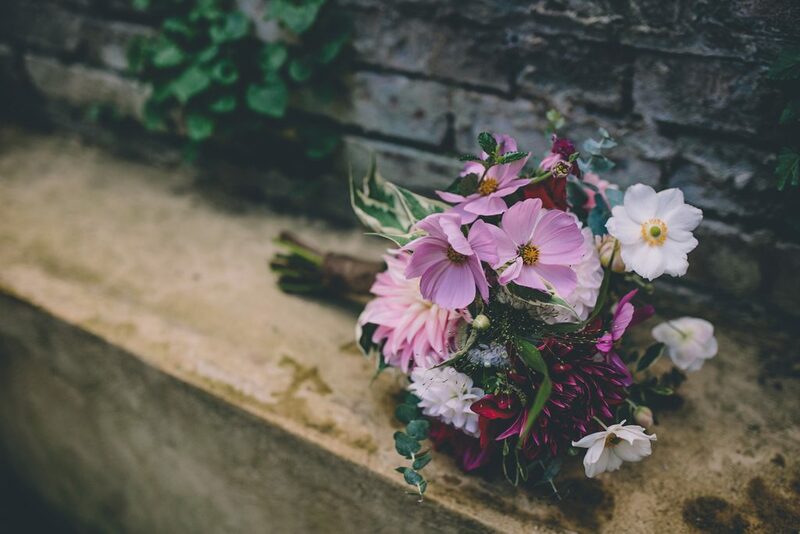 Snapdragons, roses, thistles formed the basis of the bridal bouquet, with english cottage garden geraniums, dahlias and mint in pots and planters around the garden reception venue. 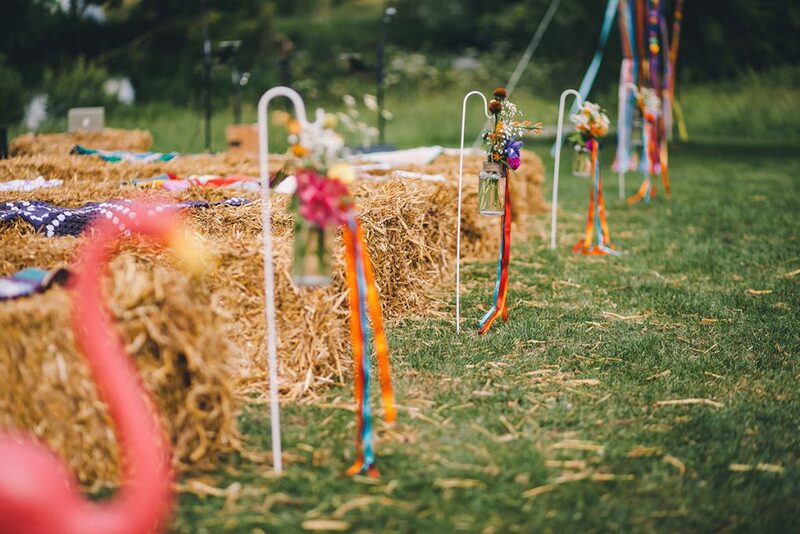 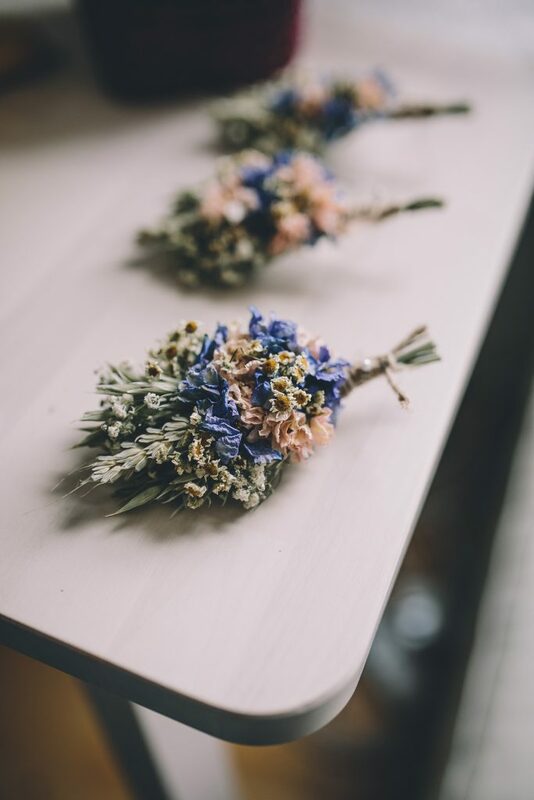 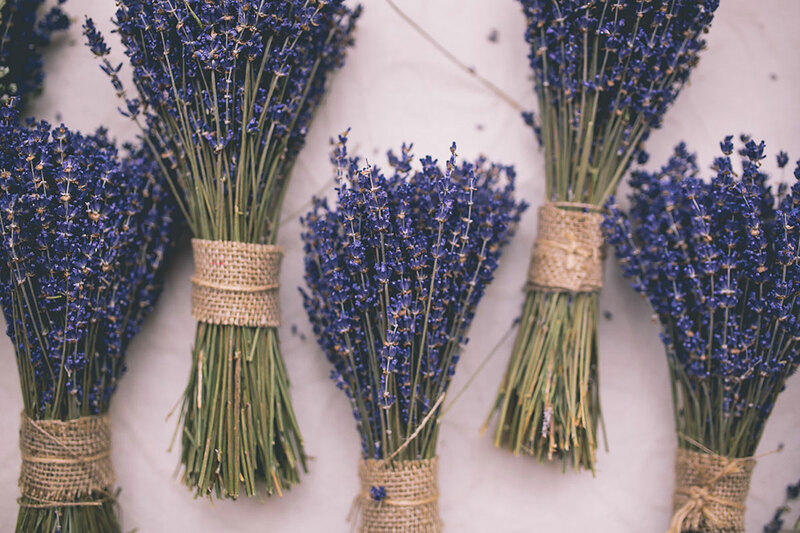 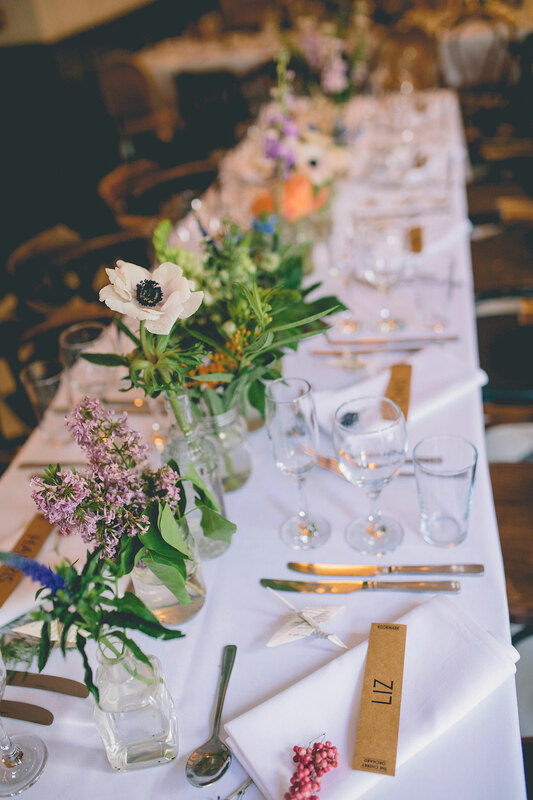 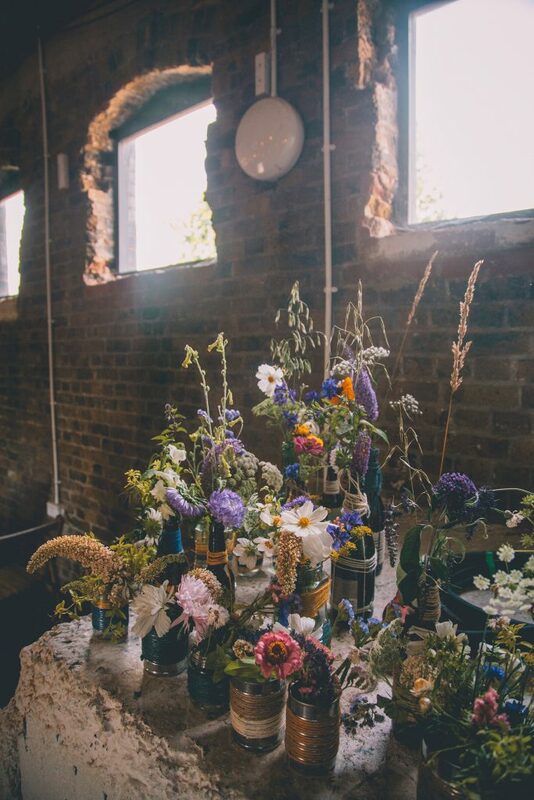 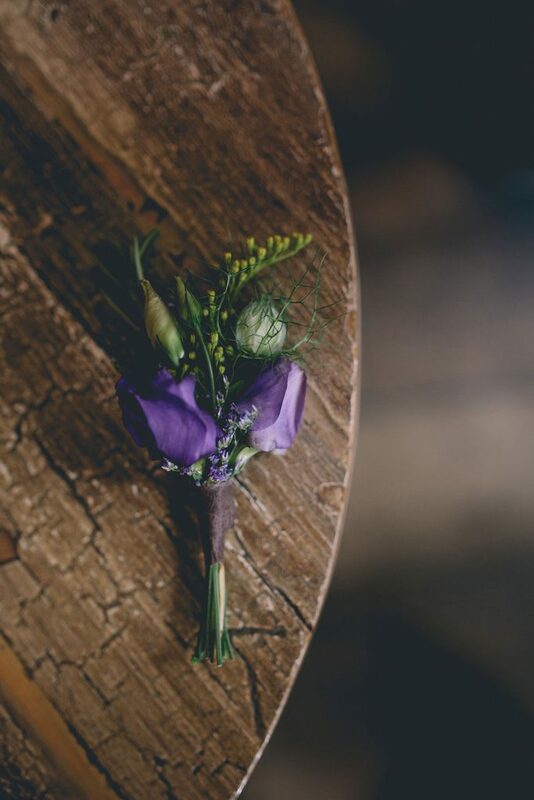 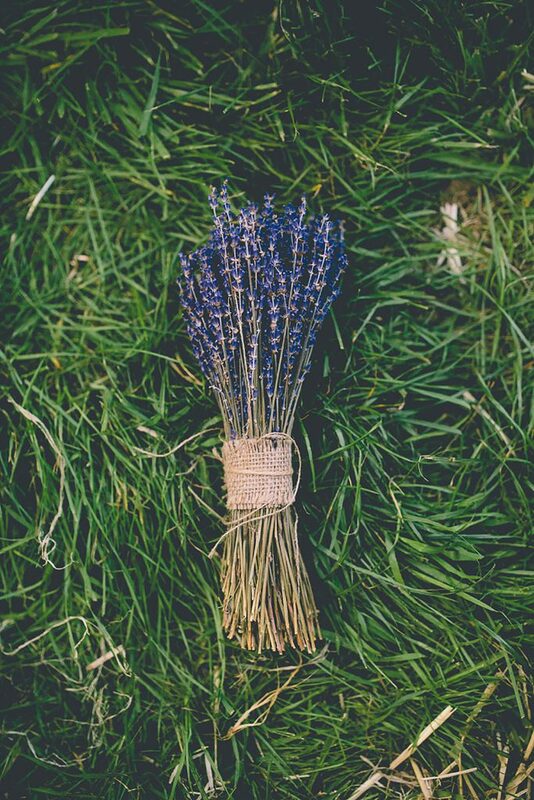 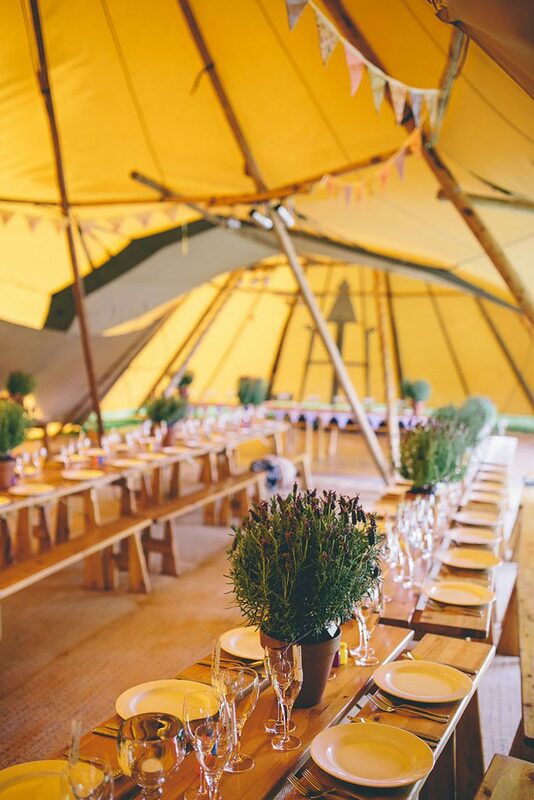 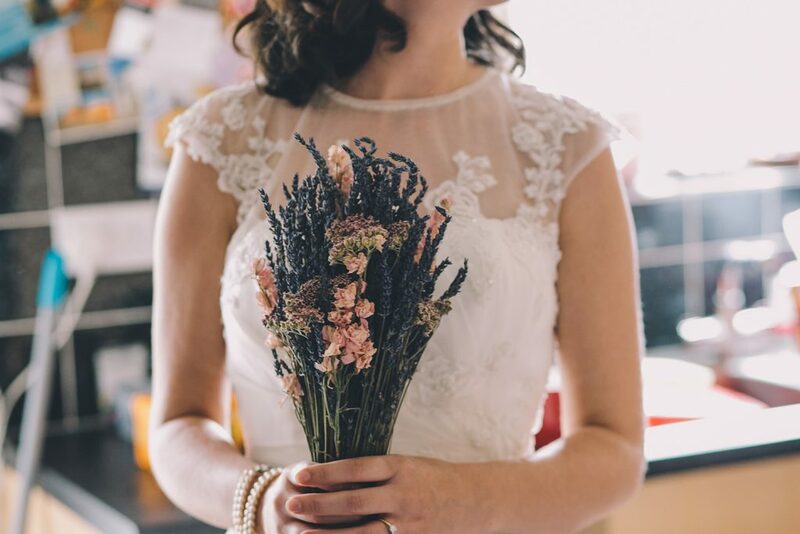 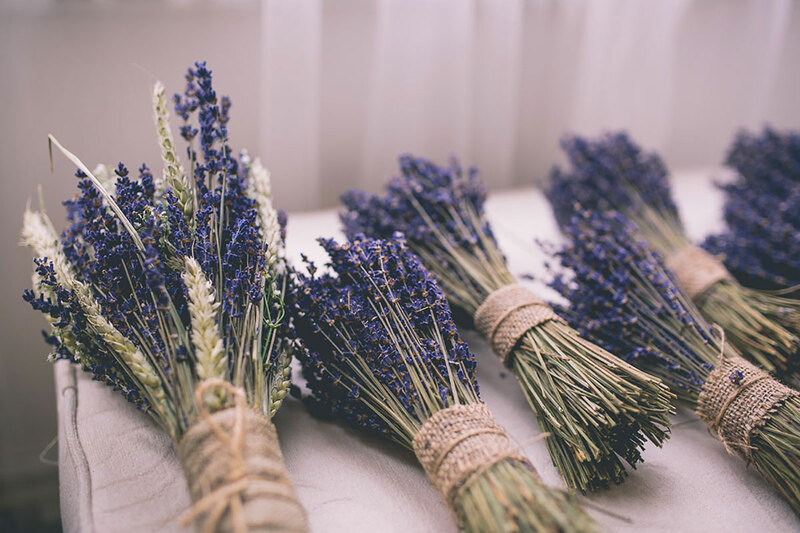 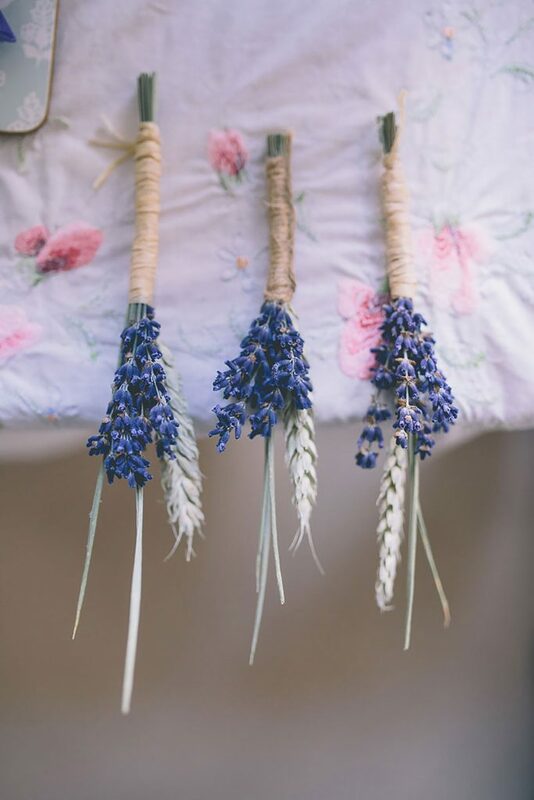 Victoria and Adam’s flowers were true to their laid back tipi festival wedding – simply english lavender across the bouquets, buttonholes and potted plants on the long trestle tables. 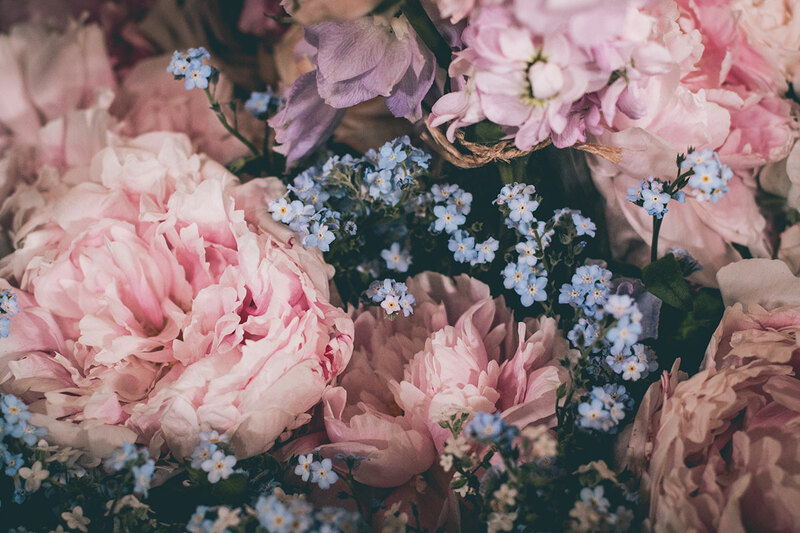 They created them themselves, and the result couldn’t be more perfect. 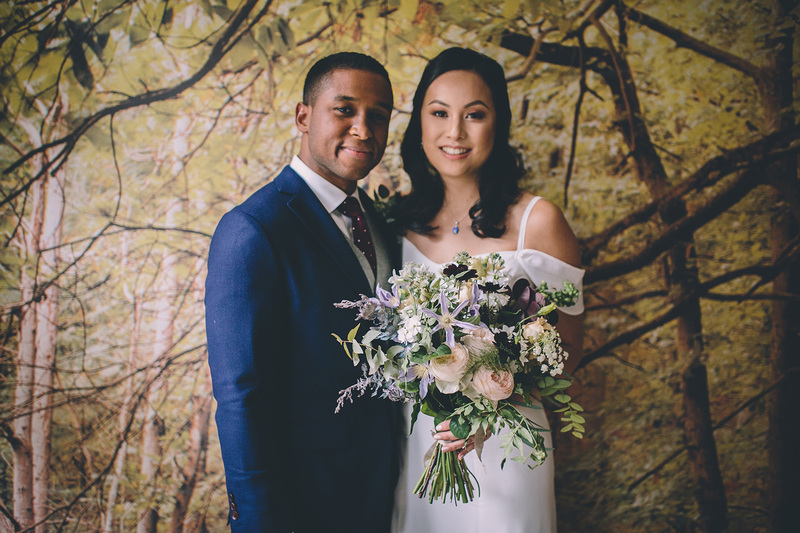 This wedding not only has the most stunning bouquet but the venue was transformed into a breathtaking walk through an English country garden – lisianthus, stocks, love in a mist, anemones, iris’ and roses featured, paired beautifully with eucalyptus and fern leaves. 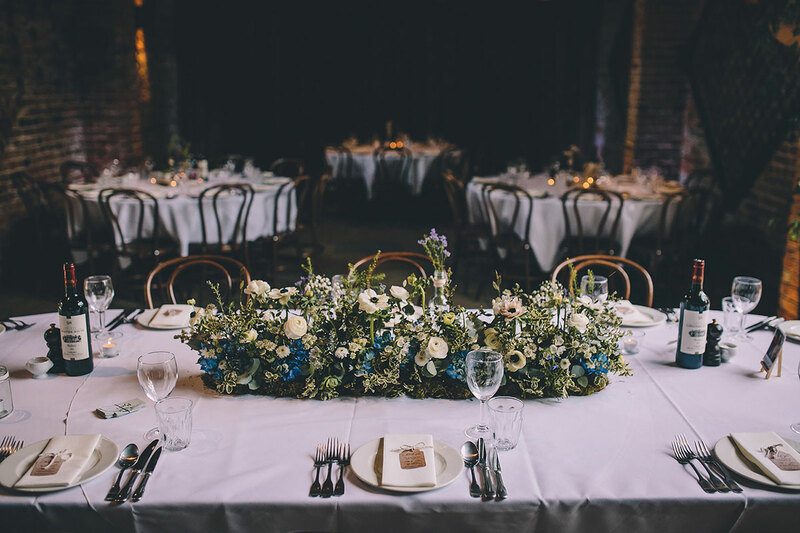 They complemented the Victorian, London pub venue perfectly. 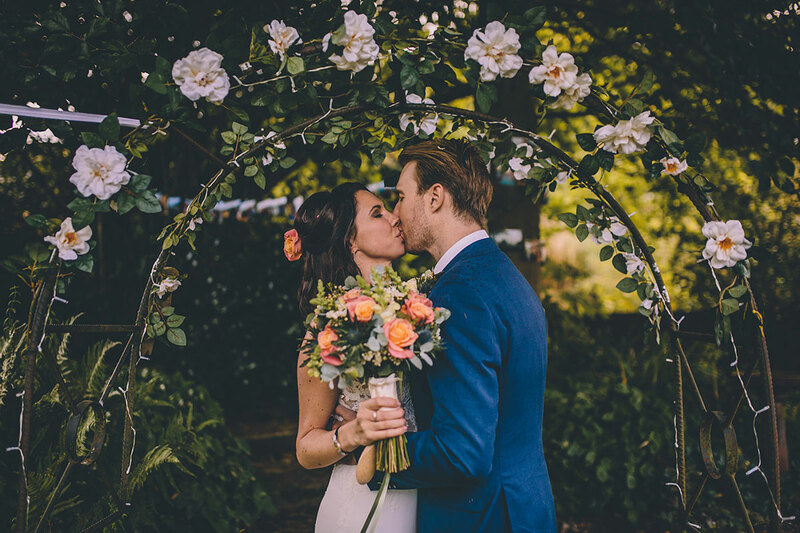 There were three beautiful floral focal points in Sarah + Stuart’s big day – the Indian-summer inspired bouquets, the stunning flower arch and Sarah’s delicate floral crown. For us, the floral arch was the more stunning of all – rich hydrangea heads in varying shades of blues, purples and pinks, married with vintage roses and vines of lush green leaf made for a ceremony location to remember. 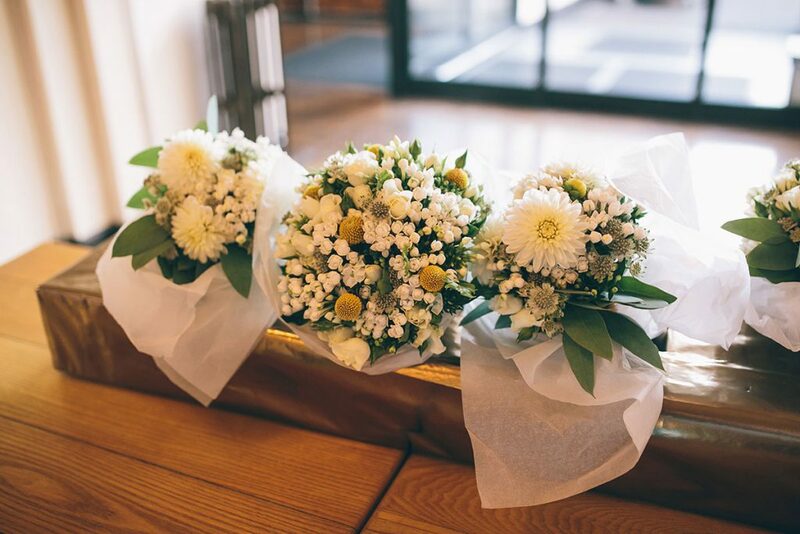 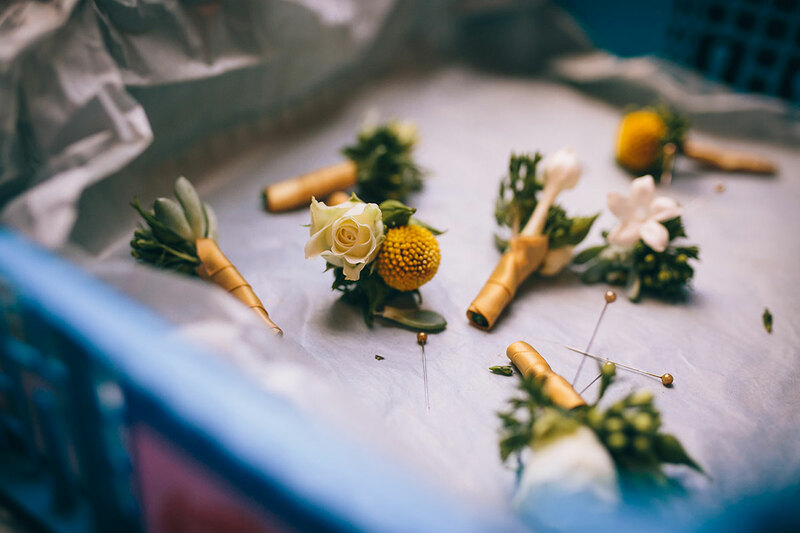 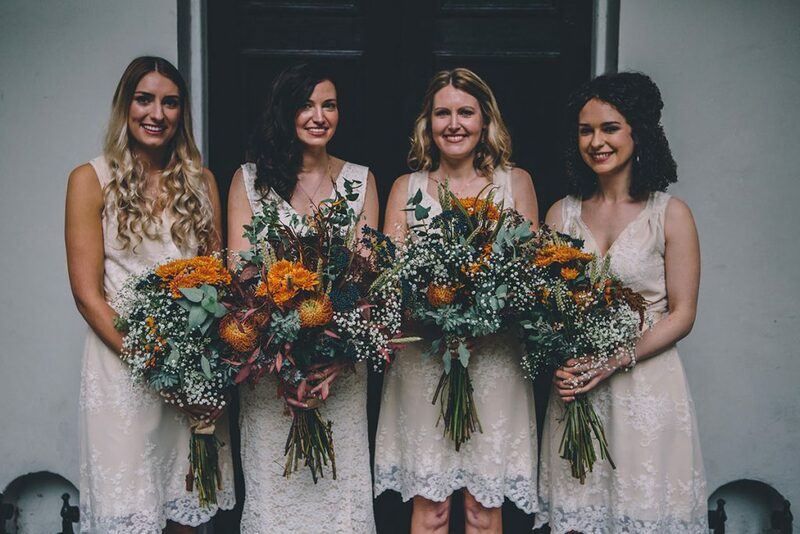 Another autumn-hued floral theme, Rachel and her bridal party had gorgeous over-sized bouquets with eucalyptus, wheat, orange leaves and chrysanthemums which were mirrored elegantly in the buttonholes. 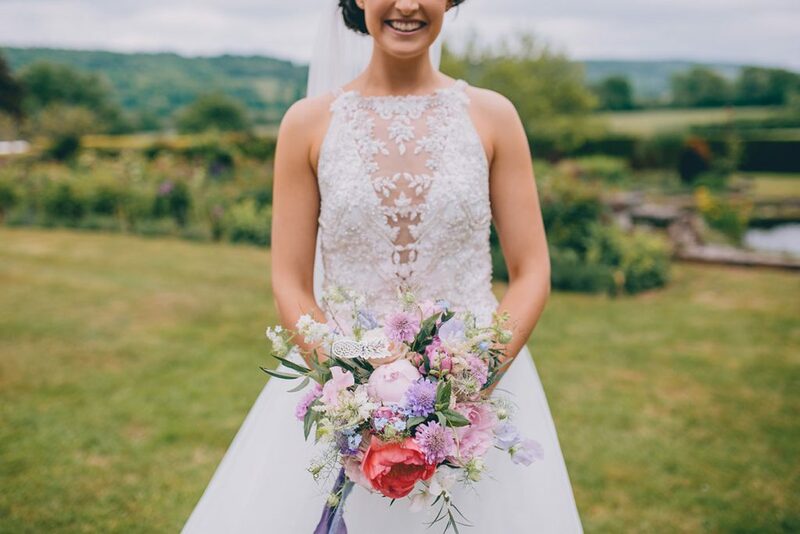 Natalie’s flowers spanned a small portion of the colour spectrum but in the most intricate and textured detail. 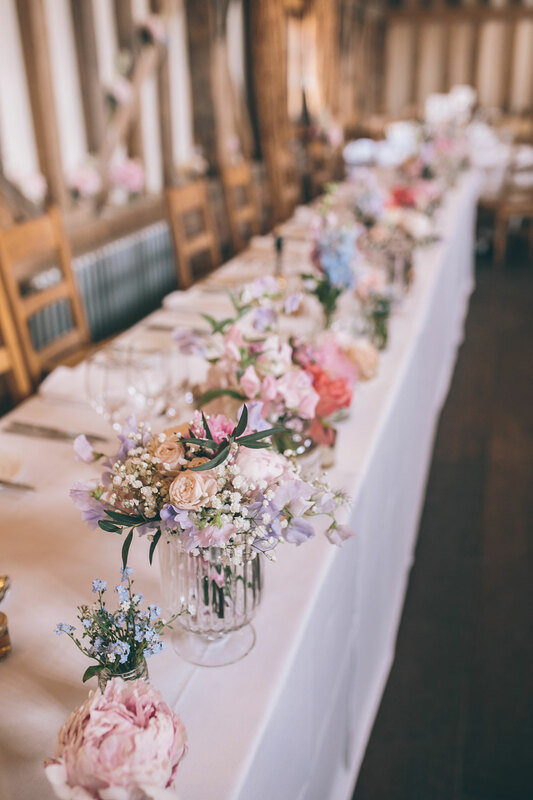 Peonies, scabious, freesias, roses and love-in-a-mist and forget-me-nots all combined to create a stunning pink and purple display for both the bouquets and the table decorations. 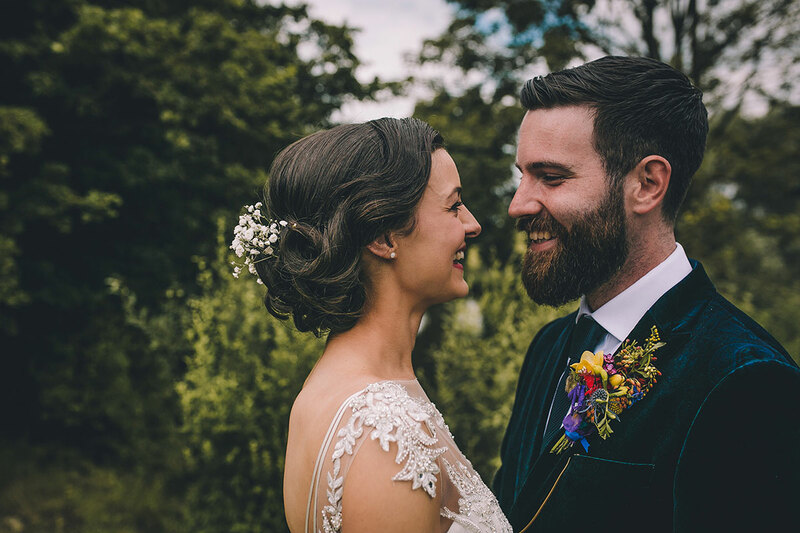 For their October wedding, Fran + Matt opted for white and golden hues. 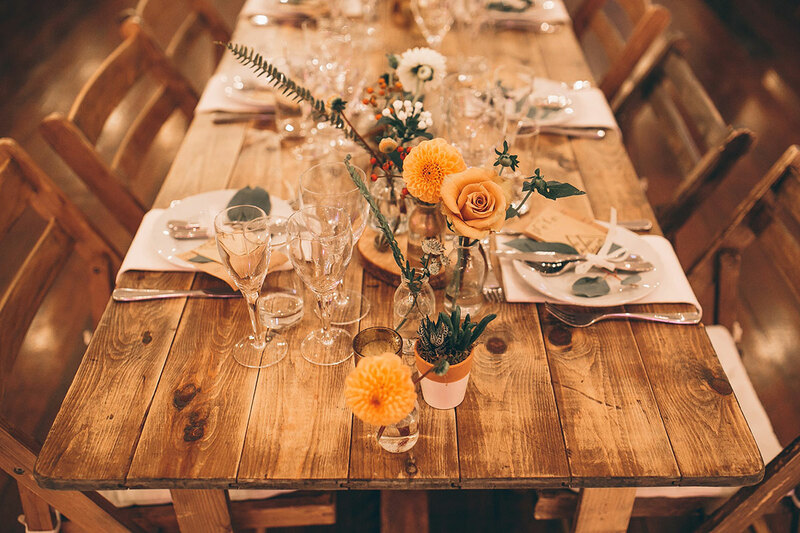 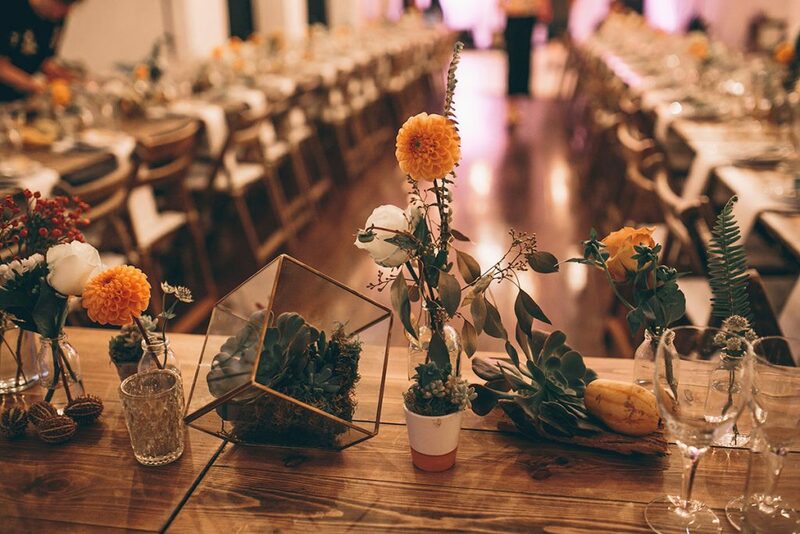 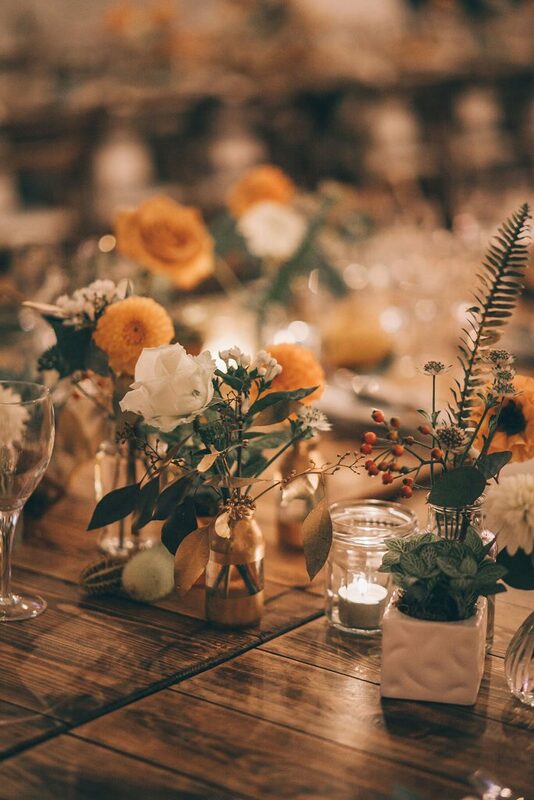 Fran isn’t a huge flower enthusiast but her love for plants led her to choose to keep the bouquets simple and decorate the tables with little succulents in a variety of gold pots and geometric terrariums. 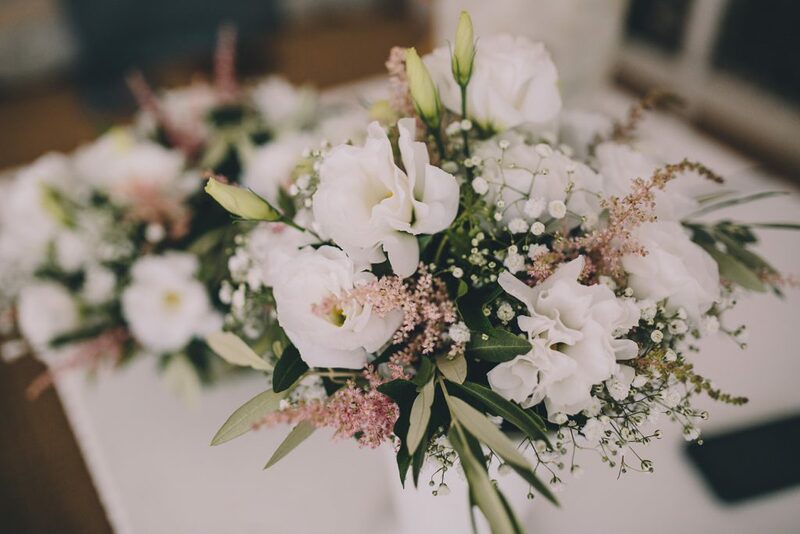 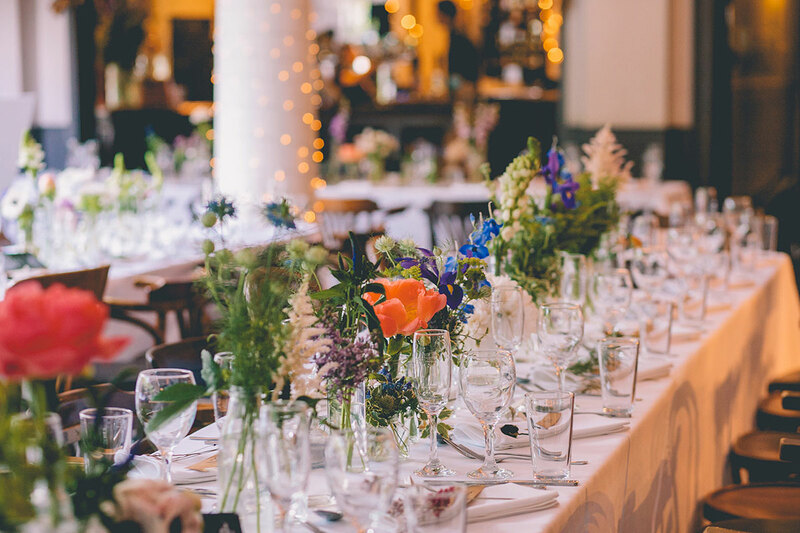 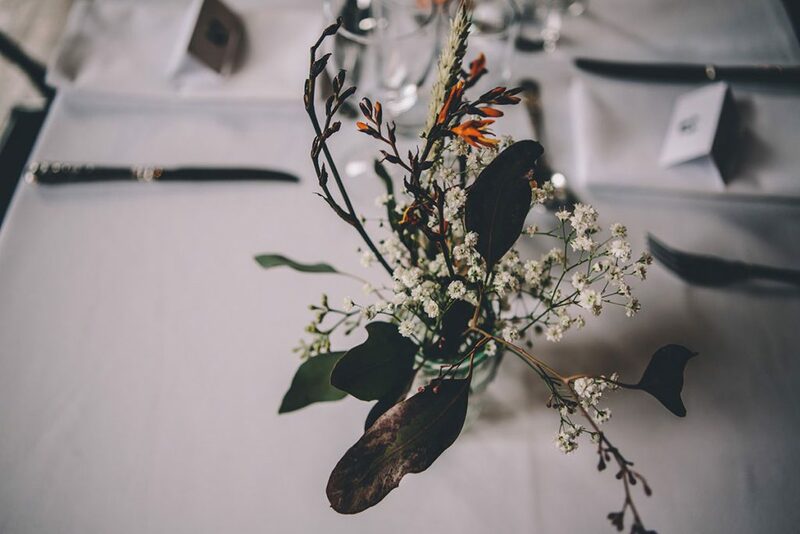 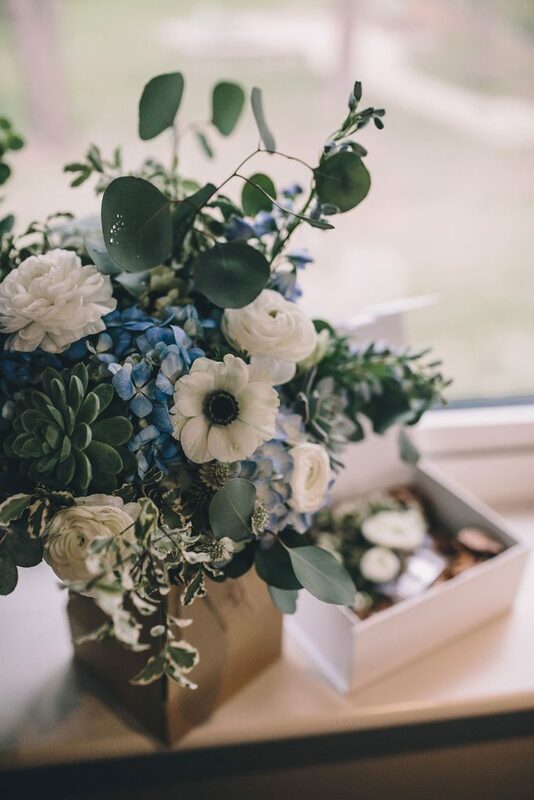 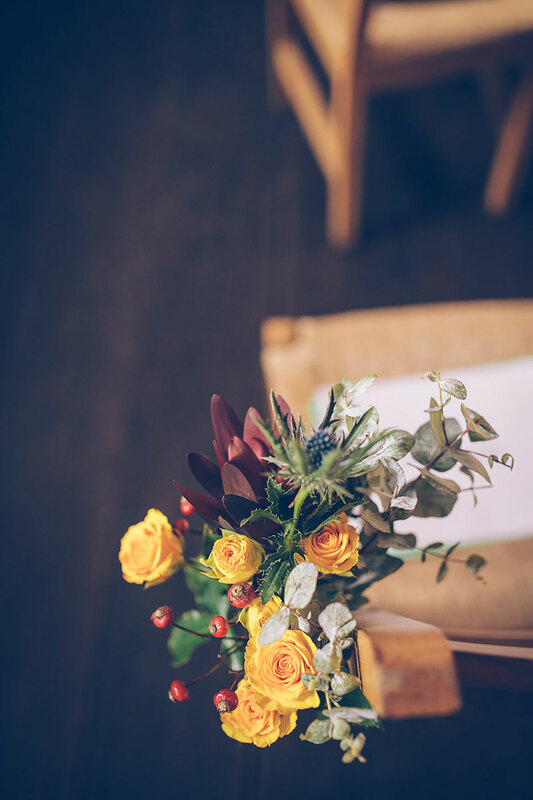 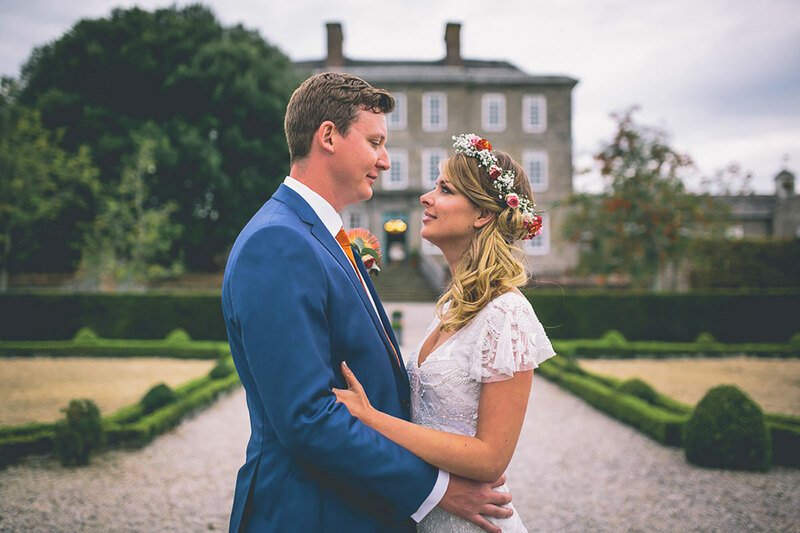 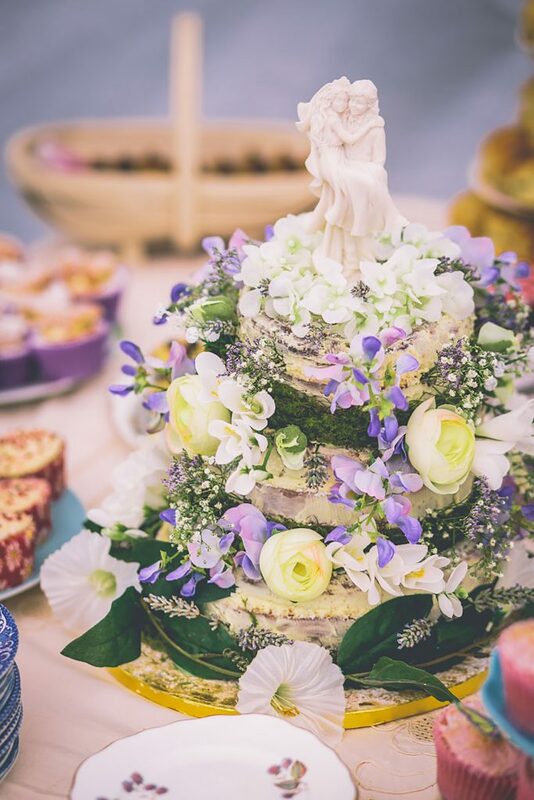 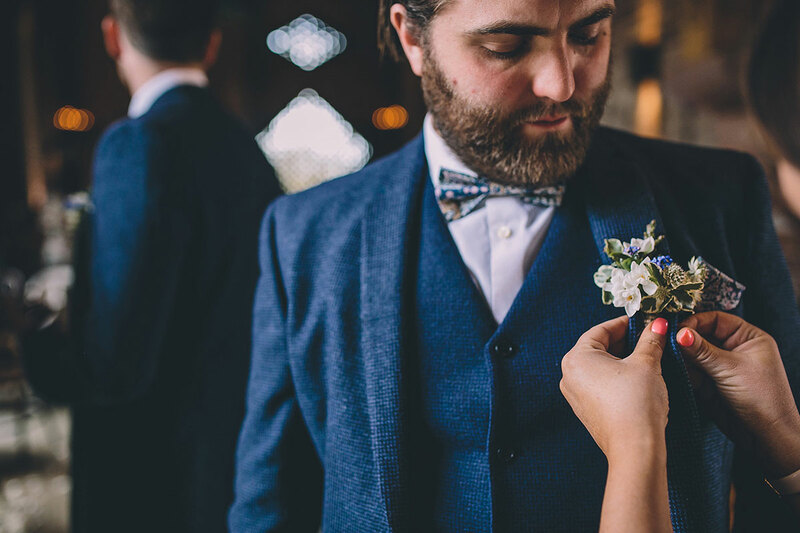 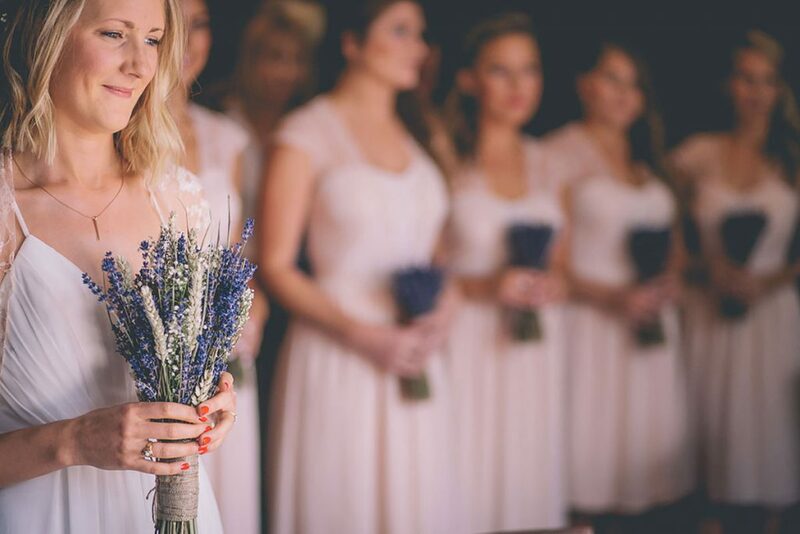 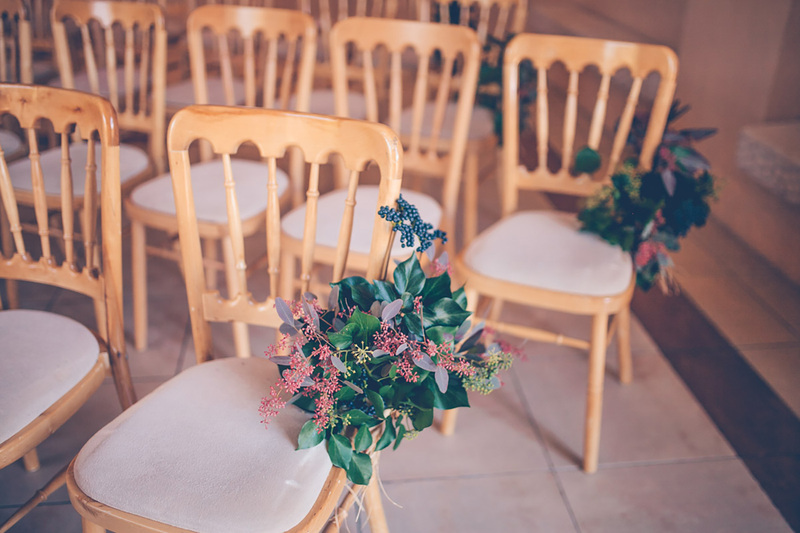 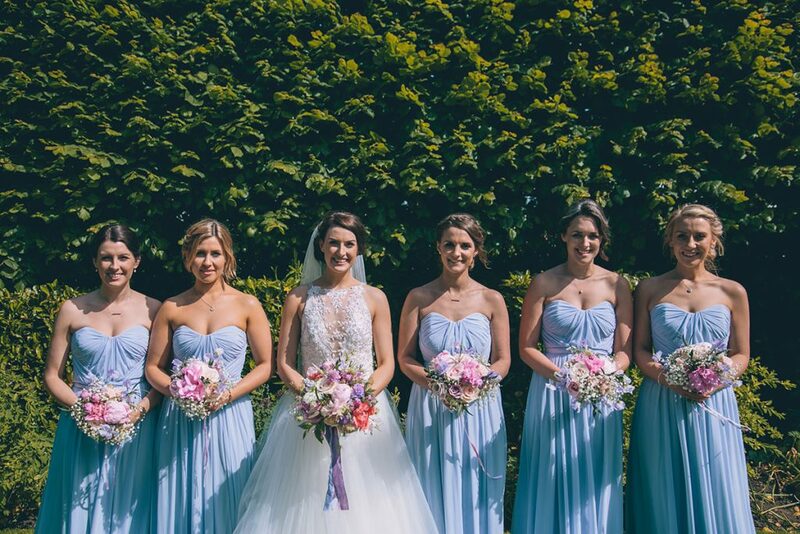 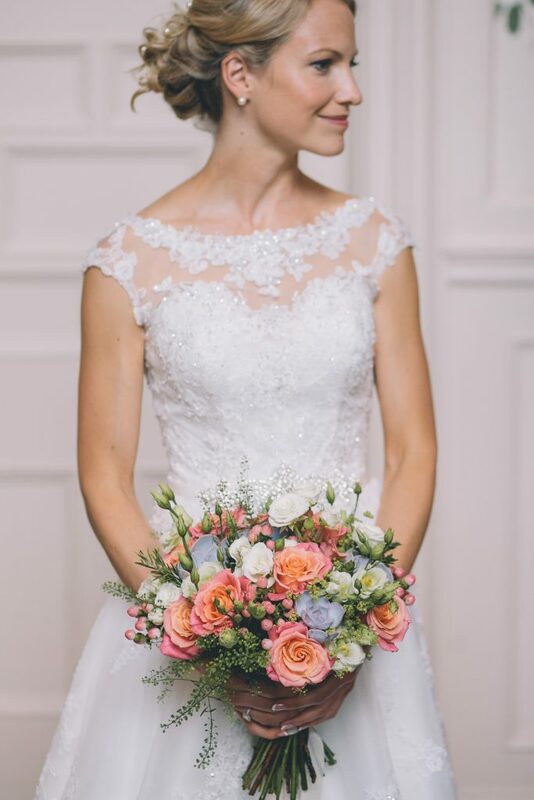 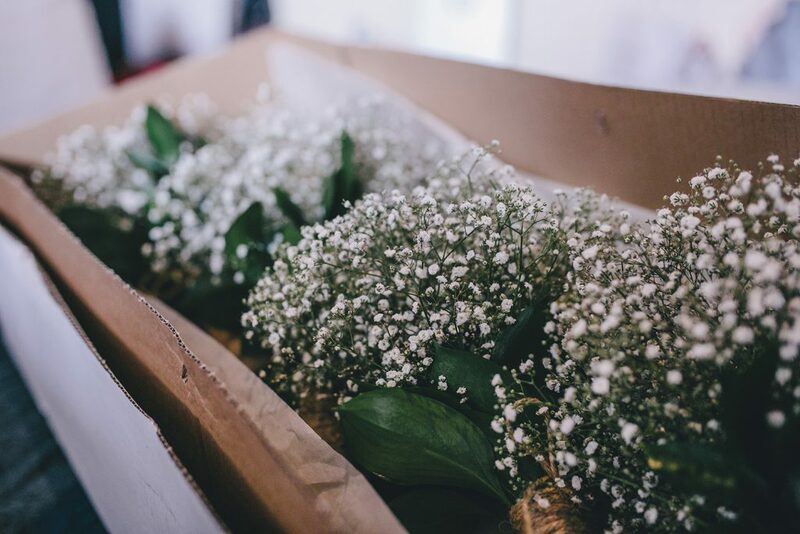 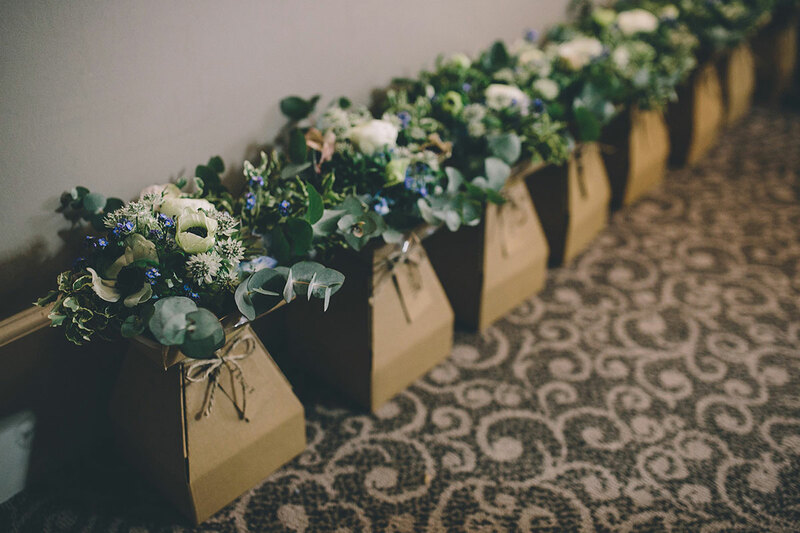 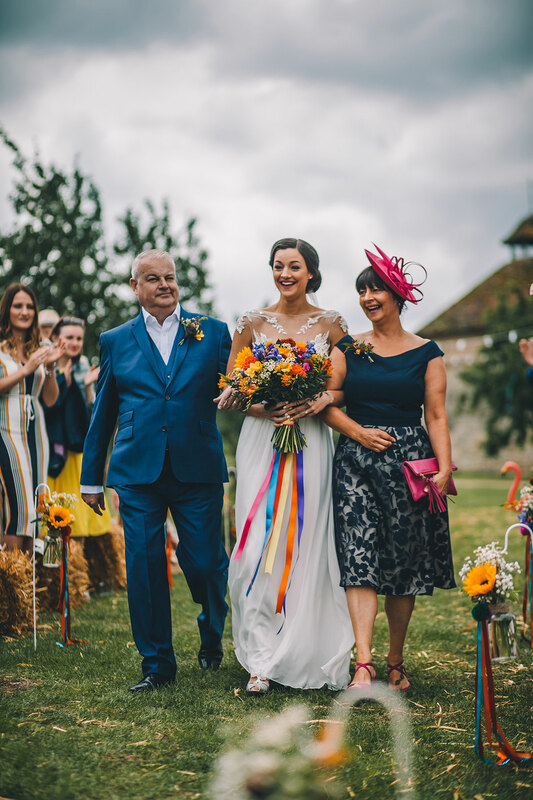 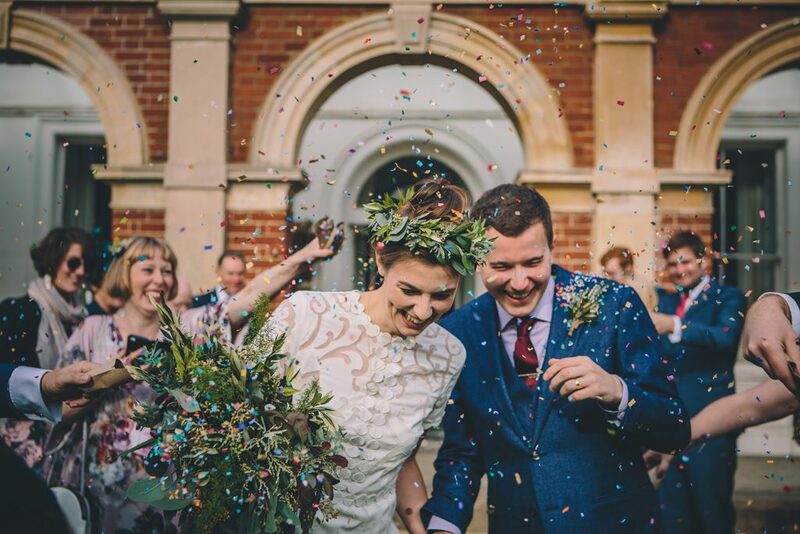 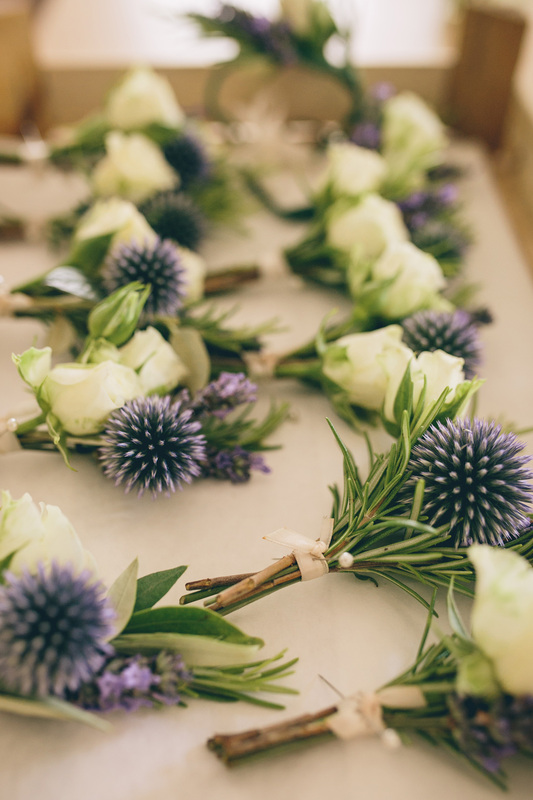 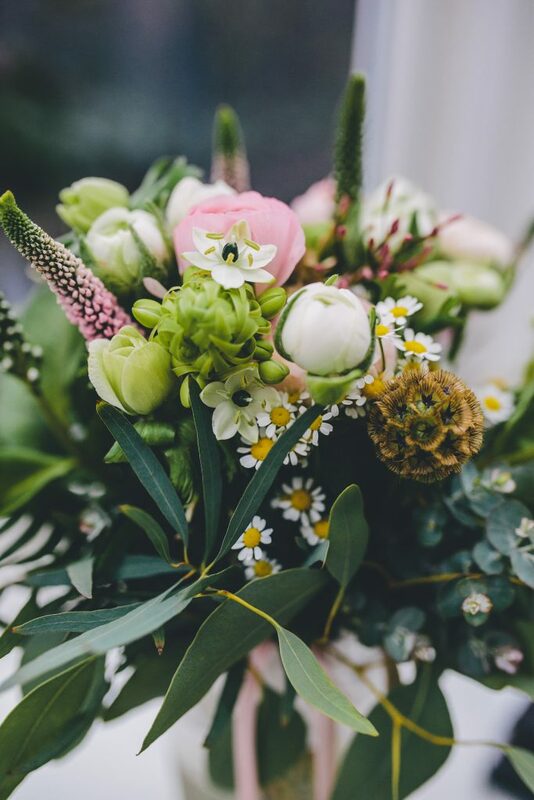 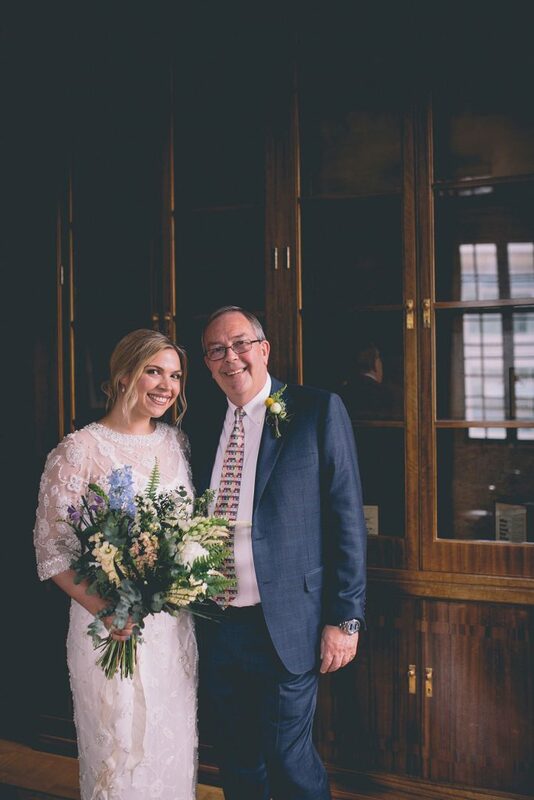 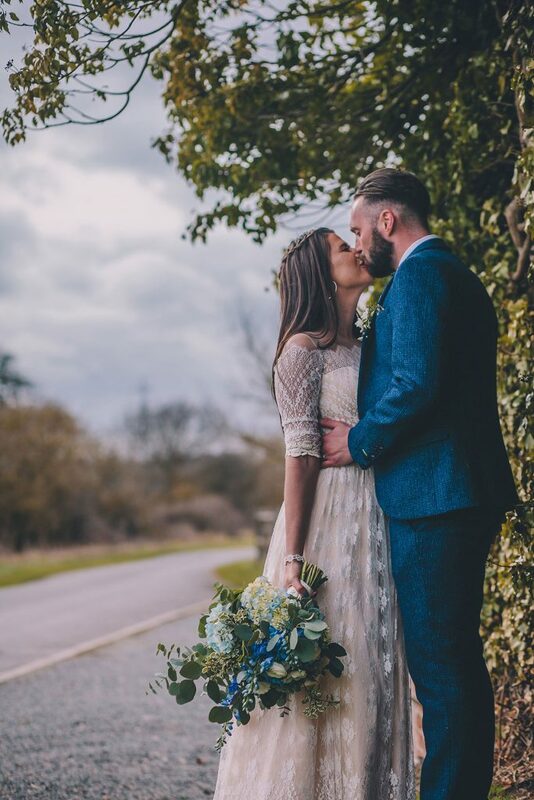 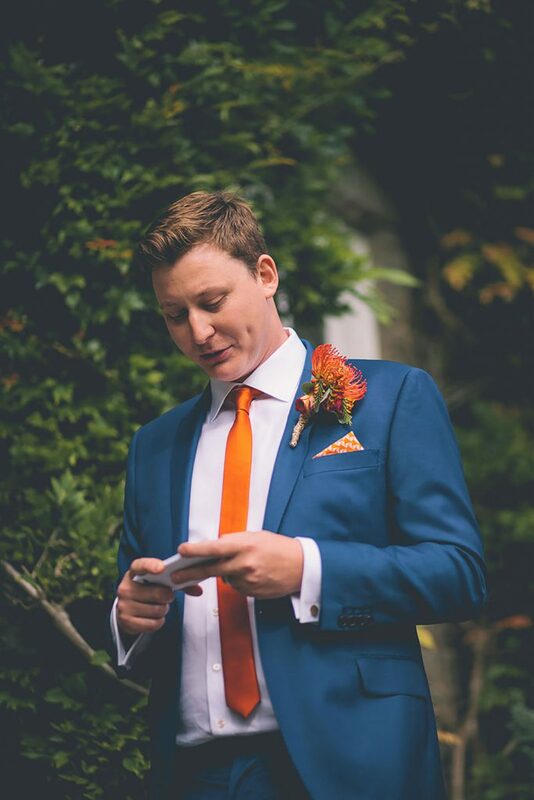 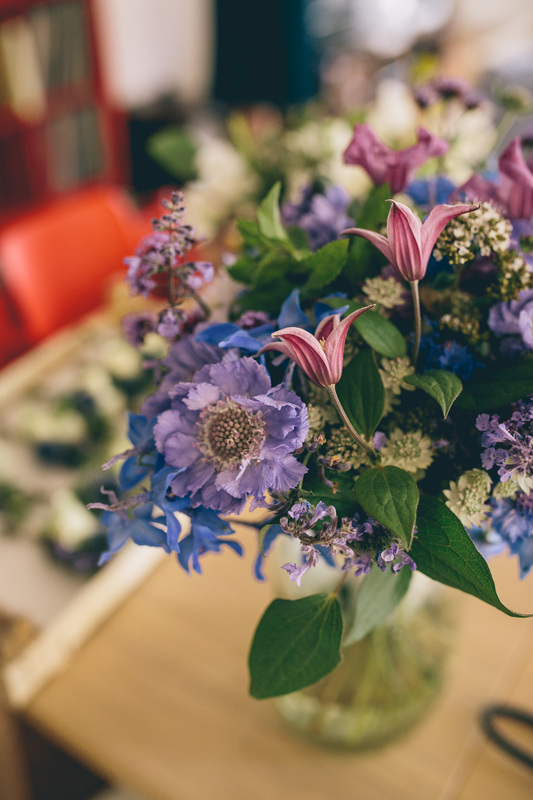 Bryony’s brief to florist Bloom Fleuriste, was to have white and blue wild flowers with lots of greenery – she exceeded expectations and blew Bryony away when she revealed her bouquet on the day. 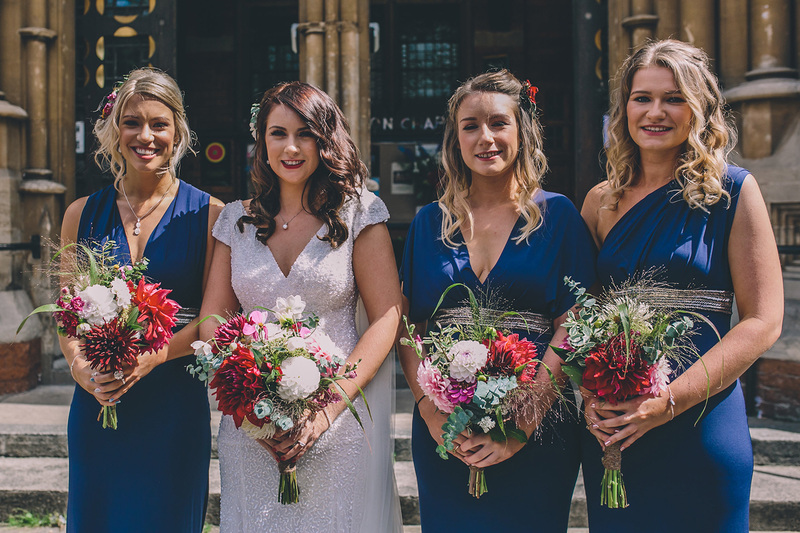 The bridesmaid’s had smaller versions of the main bouquet, which included a stunning hydrangea head, anemones, astrantia, ranunculus and even a striking succulent. 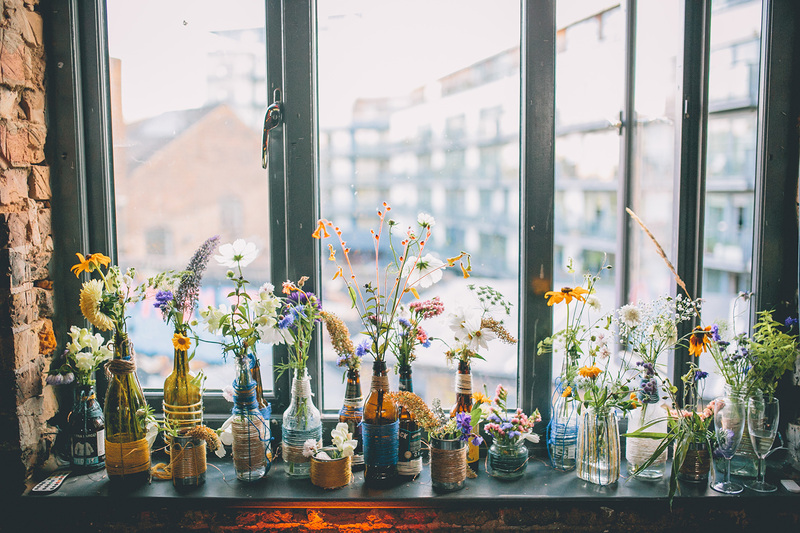 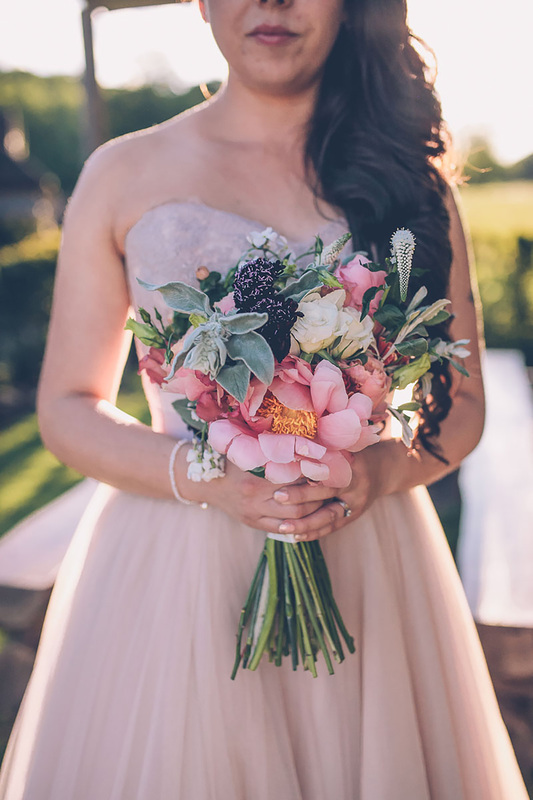 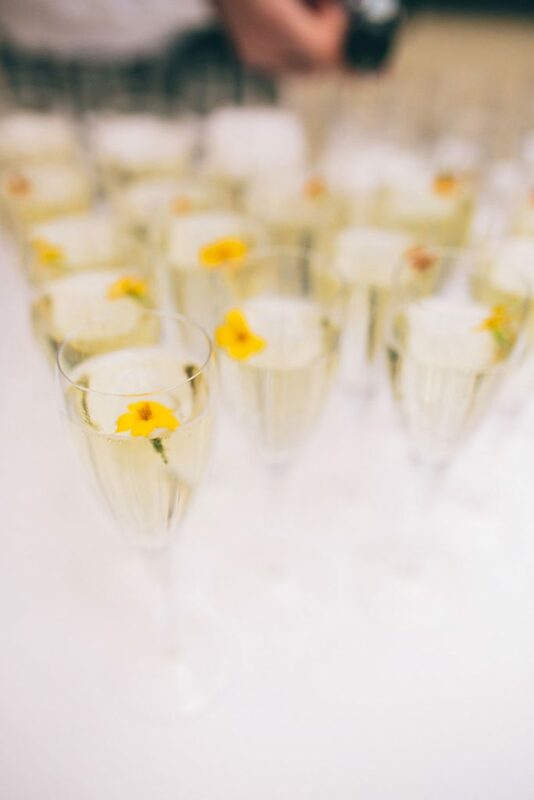 We love all flowers, but here are some of our other favourite florals from weddings we’ve shot.